Andy, Douglas, and Realdonaldduck, welcome to your final challenge. At the beginning of this competition, you presented an outline for your theme park. Throughout the competition, you have built up your park piece by piece. Now, it is time for you to show off the finished product. For this challenge, you are permitted to use 5 images per themed area plus an additional 5 images to be used anywhere you desire within the proposal. You may replace up to 5 of these images with video clips if desired. Also, you may include a park map and one map per themed area without counting them toward your image restrictions. Due to the complexity of this challenge, you have two weeks to complete your proposal. All proposals must be submitted by Saturday, August 6th at midnight. Note on Unofficial Submissions: Just like in previous challenges, those not competing are welcome to make an unofficial submission. However, due to the time required to fully critique a full park proposal, unofficial submissions will receive an abridged critique of 1-2 paragraphs instead of 1-2 pages. This time, it is for the title. You'll need to pull out all the stops and really show us what you've got if you want to win the crown. Finalists, Good Luck! suppose it's probably a bit late to be asking, but could I add another themed are if I wanted to? Or do I need to work with the ones I have? You may add a single themed area to your park, either in addition to those presented in your original outline or replacing one of them. Other than that, you must stick with what was in your outline. What defines a culture? For the Russians, it is their legends, folklore and fairy tales. It is almost impossible to overstate how important these have been to Russian development. The Russian arts have always found inspiration in their folkloric past. Contemporary Russian culture has seen a renewed interest in this mythic heritage, largely due to its rediscovery after the restrictive Soviet era. This fantastical subject matter, while obscure to an American audience, is known and beloved to every Russian schoolchild, as famous as Superman or King Arthur or Mickey Mouse. Their legendary stories speak more truly than anything to the heart of the Russian identity. With Russia’s current cultural climate and economic strength – sixth-largest worldwide – the timing is ideal! 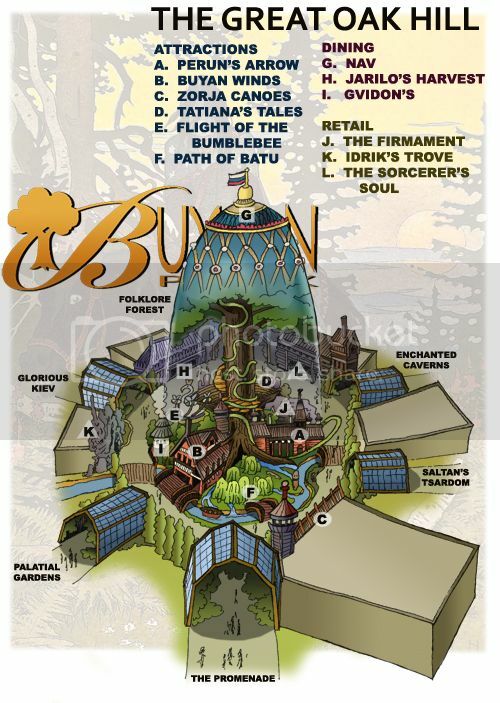 Announcing Buyan Park, a theme park dedicated exclusively to Russian folklore and fairy tales! Buyan Park shall be Russia’s first themed park, quite a step up from amusement parks like Divo Ostrov (Island of Wonders) or Sochi Park. It is to be located just outside of St. Petersburg. With 4.6 million people within the city limits, and another 10 million nearby, Buyan could be a great locals’ park. With St. Petersburg as Russia’s top tourist destination, domestically and internationally, Buyan could be a year-round tourism resort. And despite winters which defeated both Napoleon and Hitler, we do mean year-round! The vast majority of Buyan Park is enclosed within a series of self-contained structures, each containing its own “realm.” Attractions in these “realms” are often in their own separate structures. Climate controlled and wholly immersive, Buyan Park fully controls its themes, and fully conquers the weather. Visitors first enter The Promenade, which transitions to fantasy by means of a romanticized tsarist metropolis. Centrally located within the towering Buyan Egg is The Great Oak Hill, where Buyan Island itself hosts the Slavic Pantheon. Nearby is our sole outdoors realm, Palatial Gardens, a bucolic parkscape and home to assorted seasonal events. Glorious Kiev transports visitors to ancient Kievan Rus’, a time of knights and warriors. In Folklore Forest, Russia’s myriad fairy tale creatures dwell under a wooded canopy. 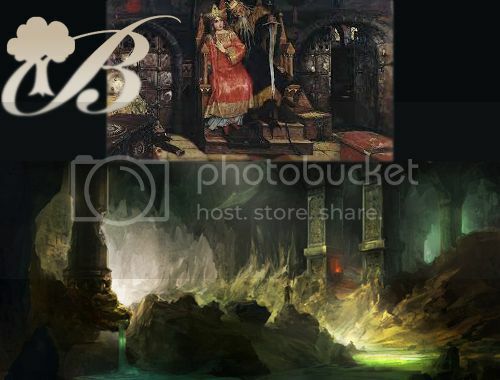 The villains of Russian folklore are found in the deep recesses of Enchanted Caverns. Finally, Saltan’s Tsardom is the palace complex of Tsar Saltan, wealthy patron of the Russian arts. To reach these wonderments, guests head southeast to St. Petersburg’s outskirts, to Leningrad Oblast, where building codes allow greater design freedoms. 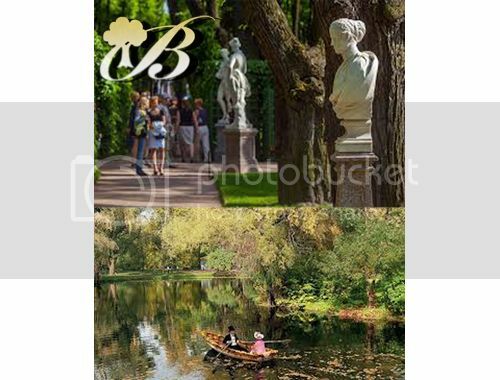 Buyan Park is strategically located on former fields along the gorgeous banks of the Neva River. It is near two major highways, the A-118 and the P-21, allowing access from the city center plus major airports. Metro travelers reach Buyan from downtown by the Line 4 subway route; shuttles transport guests the short remaining distance from the Utilisa Dybenko terminus. No matter their method, arriving guests are first greeted with a panoramic view of Buyan Park’s stupendous minarets. Standing 400’ tall in the center is the Buyan Egg. Buyan’s crown jewel resembles a titanic Faberge egg. Diamond-shaped glass shimmers. Its cylindrical structure recalls London’s Gherkin skyscraper. All around the Egg’s base are other structures to other realms, with Russian Revival facades and onion dome tops. Motorists leave their vehicles on-site in the Baba Yaga Garage. This is a stacked, enclosed parking structure. Like all our other buildings, Baba Yaga Garage is climate controlled for year-round comfort. Eventually, all guests arrive at the Slavic Square. Here is a transportation center for motorists, metro commuters, tram riders, and passenger drop-off. Here too are the entrances to Buyan’s many pristine offerings. The Grand Slavic Palace (see “Lodging”) is a stupendous four star hotel with direct park access and views of Palatial Gardens. The Buyan Theatre (see “Saltan’s Tsardom”) is a venue for hard-ticket live performances. And then there is the entry gate: The Great Gate of Kiev. This dreamlike portal is like something from the collective Slavic subconscious. A 19th century design by Viktor Hartmann, never achieved in reality, subtly resembles a medieval helmet. It is topped by an animated Russian coat of arms, its two-headed eagle beckoning guests. Three tower bells chime every quarter hour. High over the Great Gate is the entry realm’s singular massive onion dome. Within, adventure awaits! Thanks to our predominantly indoors setting, Buyan Park can operate year-round. We are open daily from April through September and during the weeks surrounding major holidays. At other periods, when St. Petersburg’s tourism market wanes (but never truly vanishes), Buyan Park is open Fridays through Sundays. The park opens daily at 10 AM. It is open until midnight during peak seasons, taking advantage of the summertime White Nights. During the savage winters, we close at 10 PM. These operating hours are subject to modification based on crowd patterns and other unanticipated factors. While other Russian parks charge by the ride, Buyan Park offers a single admission ticket which provides an entire day’s worth of fun. Tickets for visitors 13 and up are 2,000 rubles (roughly $30 U.S.) and for children are 1,500 rubles ($22 U.S.). Infants under 3 are free. This pricing accounts for average Russian income, while keeping Buyan a premium experience. To compare, tickets to Europa Park or Efteling are over 1.5 times pricier. Multiday tickets get 10% cheaper with each additional day, with a maximum savings available at 50%. Buyan Park’s year-round season pass - Glazunov’s All-Season Pass - is offered to adults for 6,500R ($100) and to children for 5,000R ($75). Passholders and hotel guests both may Extend the Quest with an additional morning hour within the park on select attractions. For an extra 1,500R ($22), guests may purchase a one-day Bogatyr Pass. This front-of-the-line pass lets guests to bypass certain queues. The Bogatyr Pass allows only 2 uses per hour, which grants passholders the freedom to enjoy the fullness of Buyan Park without inconveniencing standby guests. As we proceed to explore Buyan Park, please keep in mind that is has been designed primarily for a Russian audience. It is not an American park! Many aspects are designed for distinct Russian touring styles, distinct Russian vacations. Seemingly obscure subject matter has been painstakingly researched to guarantee it is actually familiar throughout the Slavic world. But foreign visitors have not been forgotten! Buyan’s stories are simple, and efforts are made to tell them clearly. Should that fail, the niceties of good themed design still prevail: Appealing settings, fun rides and immersive environments bridge cultures. With sizeable but not unlimited funds, Buyan Park pursues quality through a cohesive design philosophy, echoing the works of illustrator Ivan Bilibin. So much of Russian culture – its art, architecture, music and literature – has been built from her folkloric roots. Now is time to do the same in the theme park medium! What better introduction for themed design into Mother Russia than with a park which reflects on her heritage? 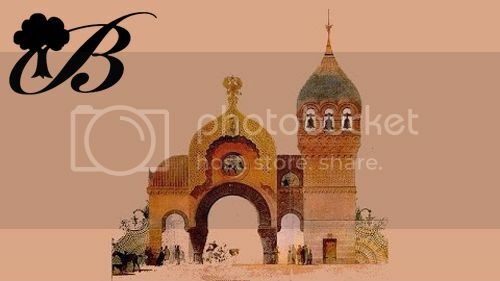 Upon passing through the Great Gate of Kiev, guests are transported into the grand circular atrium of The Promenade. Beautiful Baroque and Neo-Classical décor echoes a forgotten – perhaps never-real – 18th century Russian past. This is the time of Catherine, when Russia synthesized Western styles with their homegrown folklore. Colorful murals throughout depict the characters and journeys which await deeper within Buyan Park. Like many an entry land, The Promenade is transitional, providing a gateway from normalcy to high fantasy. The Promenade’s function is to provide park services, dining and shopping. It is the sole realm without attractions. But The Promenade is not without appeal! The Great Fountain of the Rus’ dominates in the center of a circular courtyard. The Promenade’s features radiate from it. Passage to The Great Oak Hill rests beyond. 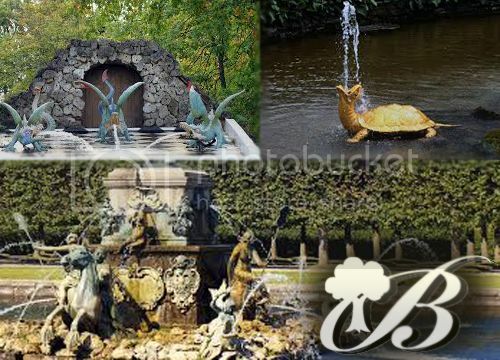 This mesmerizing fountain mimics waterworks masterpieces at Petrovskiy and Peterhof. A series of stacked pedestals within the fountain lead the eyes to a faux-bronze statue at their peak. This depicts (at a smaller scale) the Great Oak found in the next realm. The Promenade altogether bustles with energy! Additional tiered fountains cascade upwards along the land’s boundaries, themselves lined with ever-changing musical spigots. Grotto-like stone porticos are recessed in the Baroque waterfalls; these lead to The Promenade’s shops and restaurants. Since Buyan Park’s two most prominent performance venues are nearby (“Lake Kitezh” and “The Buyan Theater”), performers can easily access stage platforms within the cascades. From here they regale The Promenade with music and dance at scheduled intervals. Overhead is a vaulted ceiling, shaped like the inside of an onion dome. Ceiling walls are lined with multicolored Tiffany-style glass. This allows for different sunlight patterns as the day progresses. During winter months when the sun never appears, searchlights hit the dome from outside to create similarly enchanting kaleidoscopic effects. Uniquely, The Promenade is divided into two levels. The Upper Landing is accessible either by a grand staircase, or by a vintage elevator. Upstairs is an entry gate for hotel guests. Additional cafés and shops line the Upper Landing, with unobstructed views of the Grand Fountain. The Promenade houses Buyan Park’s dedicated guest services. It is valuable now to say a word about park operations. Buyan Park is an international tourist destination. Signage throughout is multilingual, in both the Cyrillic and Roman alphabets. Cast members are encouraged to be at least bilingual; their nametags list their languages. The “Unified Buyan” mobile app aids with similar needs. It provides translation services for Buyan’s shows, menus and signage. Live wait times are posted. Dining reservations are offered. Interactive games make the lines pass by. Because Buyan is open year-round, wintertime guests will arrive wearing massive fur coats and hats. These outfits would be, at best, an inconvenience indoors, and a hazard on rides. To resolve this, The Promenade provides The Great Buyan Coat Check. This massive facility, among the world’s larger dedicated coat checks, is accessible from both The Promenade and the outdoor Palatial Gardens. Guests may for free leave their coats, or any other possessions, with Buyan’s highly-trained hospitality team. Free lockers are also available. To the right upon entry is Buyan Oblast, our dedicated customer service center. Here, professional staff help guests with all conceivable needs. General amenities include a lost & found, All-Season Pass processing, and a purchase pickup station. (These same services are also found in The Grand Slavic Palace hotel.) Private and VIP backstage tours assemble here. Buyan Park wishes the very best for her guests, and tries for this with exceptional park services. Dining in Buyan Park is carefully balanced to accommodate all palates and budgets. Guests will find fancy sit-down bistros, convenient counter service meccas, and simple snack stands. Naturally, Russian cuisine features. Luckily, cosmopolitan Russian eaters also favor a wide variety of international cuisines. American dishes like burgers, so omnipresent in stateside parks, are found, but not in abundance. Dining options are rounded out by mobile carts offering simple Russian street foods, which are not listed in the sections that follow. “Bilibin’s,” named for Ivan Bilibin, offers one of Buyan Park’s finest dining experiences. 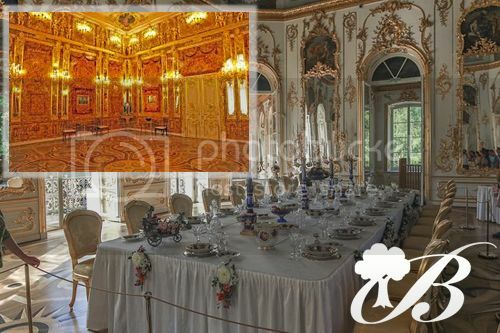 This table service restaurant recreates a tsarist dinner in the famed Hermitage Pavilion of Catherine the Great. Furnishings reflect the high culture seen in places like St. Petersburg’s Taleon Imperial Hotel. Cordon Bleu chefs present dishes which reflect international European tastes, particularly the French cuisine which so influenced 18th century Russia. Tables reflect the Hermitage’s mechanical creations: Plated dinners automatically rise within the table from the kitchens below. Summertime vegetables are grown on-site in Palatial Gardens. “Bilibin’s” specializes in a world-class vodka selection, served in the manner preferred by Alexander III. Buyan’s exclusive bar and lounge, complete with live piano accompaniment at peak hours. This space is modeled after the near-mythical Amber Room, a priceless chamber of gold leaf and amber which vanished during World War II. Beyond a menu of quality vodkas and beers, “The Amber Room Lounge” offers appetizer selections from “Bilibin’s.” Special caviar tasting menus complete the experience. Meant primarily – but not exclusively – for hotel guests entering on the Upper Landing, “Promenade Café” offers stunning views of the Great Fountain below. The setting and menu are similar to the countless sidewalk cafés throughout Europe. Cold cut sandwiches, stylish coffees, and light salads, all in a familiar international style. Beside “Promenade Café” is “Neva Bar,” a casual watering hole lacking the airs of “The Amber Room Lounge.” This is a simple yet elegant bar, Russian Revival in style, ideal for guests looking for a break after a long day of fun. 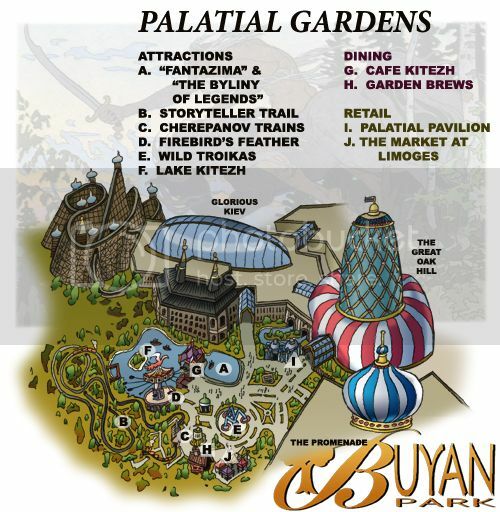 Buyan Park strives to offer unique merchandise dedicated to nearby lands and attractions. Some of these goods are high-quality handicrafts. Others are traditional souvenirs, like clothing and toys and stationary, emblazoned with Buyan-specific characters. The shops at The Promenade alone offer merchandise from across Buyan’s lands, perfect for end-of-day shoppers in a rush. Our park’s premiere shop, where if there’s a Buyan product they don’t carry, they can order it from elsewhere on property. “Buyan Department Store” is an expansive experience unto itself, with fine Neoclassical interiors reflecting the great European mega-shops. 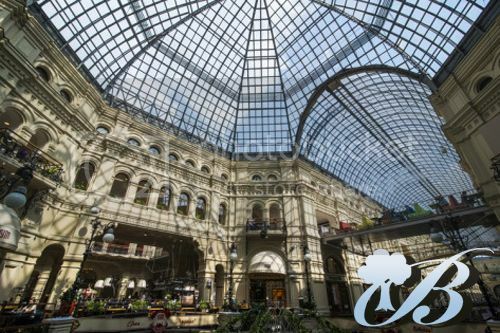 With its steel and glass ceilings, shoppers are reminded of Russia’s own pre-Soviet GUM department stores, a Slavic answer to Harrod’s. Also like Harrod’s, “Buyan Department Store” is divided into distinct sections, each specializing in areas such as clothing, knickknacks, foodstuffs, souvenirs, and more! “Upper Trading Row” offers Russian Revival ambiance with Saville Row fashion and décor. As dissimilar as this sounds for a theme park, it is a part of Buyan’s aim to appeal to St. Petersburg’s cultural community, realized elsewhere through fine art and music. Located upstairs, “Upper Trading Row” focuses on hotel guests. Russians, for their many predilections, are notorious for their sweet-tooths. To accommodate this obsession, The Promenade rounds out its shops with “Pastila Confections,” which sells pre-packaged pastries and confections. Selections include tula bread, birds’ milk cake, chak-chak, vatrushka, and the eponymous pastila pastries. At the center of Buyan Park is the Buyan Egg, 400’ tall and 300’ wide, with an “apse” around its base providing an additional 100’ on all sides. The Egg’s exterior resembles a massive Faberge egg, bedecked in splendor. Within the Egg is The Great Oak Hill. This is the setting of Buyan Island itself, a mythical paradise from Russian legend akin to Shangri-La or El Dorado. Buyan Island moves with the tides. It is the source of all life, of all weather. This is the legendary location of enchanted stones, of sorcerers’ souls. It is home to the entire Slavic pantheon. Here, the heavens join with the earth. Standing tall at the realm’s center is Buyan Park’s central, iconic Great Oak. This gigantic tree towers to the heights of the Buyan Egg, countless streams and shrines accumulated at its base. Attractions dot its perimeter. At its height is the Slavic heaven of Nav. Below its base is the Slavic underworld. From within the Great Oak, the Three Winds are born. These winds – North, East & West – blow forth and seed the world. Daring guests are welcome to enter the Great Oak and meet these anthropomorphized winds face-to-face. Guests queue through the foundry of mighty Svarog, god of blacksmithing. Past interactive forges, ultimately they arrive within the Oak’s hollow, where “Perun’s Arrow” is seen ascending to the treetops. 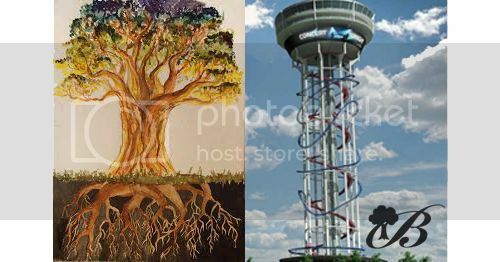 “Buyan Winds” is a drop tower entirely within this glorious tree, rising up 320’ feet. Three separate altars – one for each of the winds – rise as one, accompanied by whirlwind projection effects. At their peak, a knot hole in the Oak provides views outside. The swirling winds cease, and the altars plummet hundreds of feet in an exhilarating climax! Buyan Island too is the source of the sun and the stars. Dazbog the sun god guides his daughters. Every day, Zorja the Morning Star crosses the globe in her golden canoe, bringing light to the world. She is followed at night by Zorja the Evening Star. The two Zorjas (Auroras) are guardians of Simargl the doomsday hound; should he break his chain, the universe will end. Guests join the Zorjas on their oceanic mission, and help keep dreadful Simargl at bay. “Zorja Canoes” is a charming dark ride employing a waterborne version of EFT’s Mystic Mover trackless ride vehicles. Unlike Disney’s LPS versions, these cheaper, simpler trackless models follow embedded wires, but still create the illusion of freedom. Three canoes depart as one, until each goes its separate way, compelled by the Three Winds. Three unique ride paths depict the wide world’s many enchanted miniature sights. Guests are encouraged to ride multiple times, to enjoy different corners of the globe. A natural amphitheater sits at the base of the Great Oak, underneath a canopy of butterflies (simple decorative netting) which mask the sounds of “Perun’s Arrow” above. Giant roots on all sides bear the faces of the Slavic gods. Guests gather for “Tatiana’s Tales,” an interactive puppet show which follows in the tasteful puppetry tradition of Obraztsov Theater. Tatiana the Enchanted Cat of Buyan hosts, ready like Scheherazade with countless stories. Tatiana knows every Russian fairy tale in existence, and will happily retell them in puppet show format. The audience may call out story suggestions, which Tatiana and her coterie then perform with aplomb. 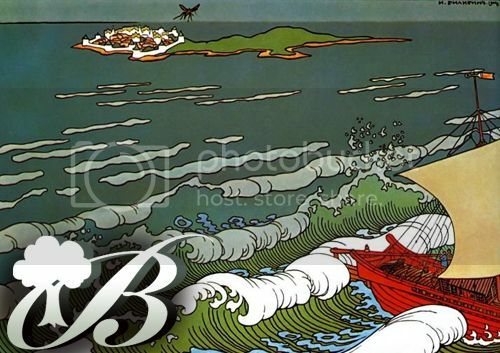 Yet another famous tale of Buyan tells of Tsar Saltan’s wife Militrisa, who was banished to Buyan Island with her son Gvidon. Aided by the Princess-Swan’s magic, young Prince Gvidon transformed into a bumblebee determined to sting his mother’s enemies. This story features in Rimsky-Korsakov’s famed musical adaptation. This brief song accompanies a spinning aerial carousel. Bumblebee vehicles circle the magnificent Princess-Swan, their heights controlled by riders. At the ride’s climax, fountains on all sides shoot water into the air! Buyan’s “Path of Batu” reimagines that pilgrimage as park-wide boat transportation between the realms. Slow, high-capacity watercrafts leave from before the Great Oak, and stop in Glorious Kiev, Folklore Forest, Enchanted Caverns and Saltan’s Tsardom. (In warm summertime, a spur route allows them to go outdoors and stop in Palatial Gardens as well.) The ride’s finale, after Saltan’s Tsardom, is a dark ride section depicting the submerged Kitezh itself, aglow with “undersea” LED creatures. Buyan Park’s signature dining experience, “Nav” (the Slavic word for “Heaven”), appropriately rests at the tallest heights of the Great Oak. Entry is “guarded” by stone statues of the giant bird Gagana and giant snake Garafena. Stained glass elevators gently carry diners 400’ upwards to an immaculate table service restaurant. Situated in the bejeweled crown atop the Buyan Egg, diners are afforded panoramic views of St. Petersburg, the Neva River, and surrounding environs. In the restaurant’s center, a chandelier holds Buyan Island’s greatest treasure: the mystical Alatyr white stone of healing. Food is Euro fusion. High-quality dishes and ingredients from varying European cuisines are masterfully combined by our executive chef. “Nav” is a cultural dining experience not often found within most theme parks. Reservations are highly recommended! Jarilo, god of agriculture, holds all the world’s seeds in a graven storehouse. Within, amidst shrines to Jarilo, is an abundance of edible plant life on display. “Jarilo’s Harvest” is a medium-sized counter service restaurant which specializes in healthy and vegetarian options, without forsaking the meats. Beside the international dishes, Russian diners find pelmeni, perogi-style dumplings steamed to perfection. Gvidon, the abandoned prince of Buyan, has long practiced fishing from his humble seaside hut. From this oaken snack shack, Gvidon offers delightful seafood treats – treats such as clam chowder, fish ‘n’ chips, and sturgeon sandwiches. Gvidon’s specialty on cold winter nights is ukha, a traditional Russian fish soup. Opposite “Nav” entry, deep in the Great Oak’s foundation, is the realm’s mightiest shop. “The Firmament” is a post-ride retail outlet for both “Perun’s Arrow” and “Buyan Winds.” The gods have formed this catacomb below the Oak’s roots, with rock forms in their images. Merchandise resembles totems and talismans of the ancient pantheon, plus shirts and bags and knickknacks. Near “Flight of the Bumblebee,” a small cavern houses the Idrik’s den. This mythical deer-like unicorn is the size of a mountain and the guardian of Buyan’s treasures. Within its trove, cracks in the granite reveal the Idrik overhead patrolling the skies. Inside, Idrik’s many sacred treasures abound for purchase, among them jewelry, precious stones, and sacred books. In yet another legend, Buyan Island is the hiding place of the immortal Koschei’s very soul (see “Enchanted Caverns”). And where is his soul? On the point of a needle, inside of an egg, inside of a duck, locked in a chest. This chest is the centerpiece of a simple crossroads shrine merchandise stand. The chest on display will occasionally open to reveal the duck. As for merchandise, “The Sorcerer’s Soul” offers simple plush toys, mugs and costuming. Slavic people love gardens! No matter the weather, summer or winter, this is possibly the most popular of all Russian pastimes. It is hard to overstate the appeal of Russian gardens, be they untamed or neatly manicured. Activities abound, from leisurely strolls, art appreciation, and relaxing exercise. St. Petersburg is famed as Russia’s greenest city, with over 200 gardens and almost countless tree-lined streets. With Palatial Gardens, Buyan Park looks to add to this wonderful horticultural tradition. Palatial Gardens is unique as Buyan’s only outdoors realm, nestled between the Buyan Egg and The Grand Slavic Palace. Palatial Gardens is even more unique for being quite unlike a typical theme park land. While there are rides and attractions, the land’s appeal is calmer, more bucolic. This is a place to escape from the wildness of Buyan’s interior. The gardens are maintained in a Baroque style, much like Russia’s Alexander Garden, Summer Garden, and the Field of Mars. Exiting from The Promenade or The Great Oak Hill, summertime gardens are laid out geometrically, planted with vibrant, colorful flowers. 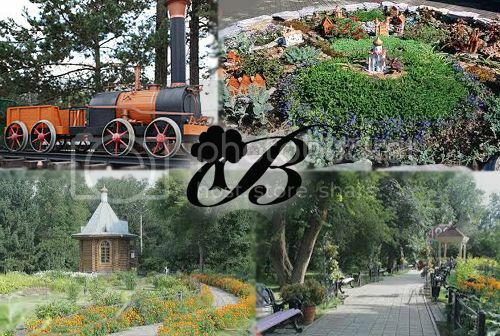 Architectural models of Buyan’s attractions dot these flowerbeds. Details include gazebos, sundials, and a floral calendar. Moving further into the countryside, past Lake Kitezh, the planting grows wilder, more forested. Palatial Gardens terminates in a welcoming wooded bower. Palatial Gardens hosts Buyan’s wide array of seasonal events, meant to entice St. Petersburg’s local community. Winter or summer, these events climax at day’s end with spectacular live shows upon Lake Kitezh. A separate park exit, The Gate of the Heroes, passes under the bridge connecting The Grand Slavic Palace with The Promenade, minimizing end-of-day congestion. In winter, The Buyan Ice Festival transforms the snow and night and cold into a glowing wonderland. Outdoor winter activities are already a favorite pastime of the hearty Russian people, so no worries there! Monumental ice block structures, embedded with ever-changing LED lights, dot the frozen landscape. Ded Morozko, Russia’s Santa Claus, is a walkaround character who greets and rewards children. His granddaughter Snegurochka also participates. Guests take part in snowman contests, ice skating, and ice sculpture galleries. Genuine Russian ice slides complete the activities. 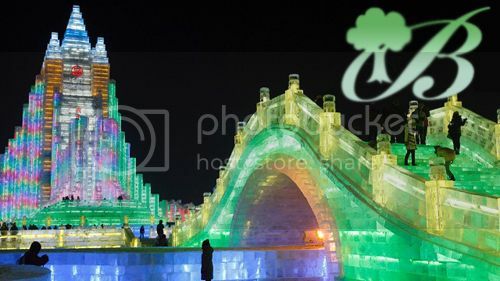 Harbin Ice Festival in China proves that “The Buyan Ice Festival” would not merely be viable, it would be stupendous! From April through August, “The Byliny of Legends” is staged upon the freshly-flooded Lake Kitezh stage. Set to Rimsky-Korsakov’s “Russian Easter Overture,” this live stunt show uses ancient Slavic imagery to tell of the creation of the world. Ships and stages on the lake depict the planting and growth of the Great Oak, of Perun’s conflict with Veles, of the creation of Mankind, and of Man’s eventual founding of Ancient Kiev. From here, medieval knights perform their deeds. These heroes combine the old rituals with new Orthodox imagery, showing how Russia has evolved. For all this excitement, the realm’s signature experience is our simple, relaxing “Storyteller Trail.” This is an expansive outdoor walkthrough, guiding guests through the wilderness past statue tableaus of scenes from Russian fairy tales. The trail is anchored by a circle of faux-bronze statues, which depict Russia’s many famed fairy tale storytellers. Atop a central pedestal is a statue of Alexander Pushkin; at his feet, an observation tower so guests may study the maze-like trails. With hundreds of fairy tales in Russia’s past, “Storyteller Trail” can be plussed annually with new scenes, bringing guests back again and again. The first Russian steam locomotive was created by the Cherepanov family in the 19th century. It was a modest “toy” railway, scaled like “Casey Jr. Circus Train” at Disneyland. Buyan Park’s perfect replica provides relaxing rides on trestles above “Storyteller Trail.” On-ride narration offers context to the fairy tale scenes below. Atop a circular platform overlooking Lake Kitezh is this simple yet elegant swinging chair flat ride. Guests spin in the air, held aloft (as the story goes) by the magical glowing feather of the Firebird, who resides atop the disk. Selections from Stravinsky’s “Firebird” suite accompany the ride. As it climaxes, water fountains in Lake Kitezh shoot upwards, tantalizing inches from riders’ feet. Lake Kitezh, situated before Glorious Kiev’s outdoors façades, hosts unique seasonal activities, as found in all Russian parks. In summertime, guests rent paddleboats for romantic water rides. In wintertime, portions of Lake Kitezh are transformed into an ice rink, where guests may skate to their hearts’ content. All throughout the year, Buyan’s well-kept horses transport guests through the bucolic scenery. Summertime wheeled carriages are familiar from New York’s Central Park. In wintertime, when the ground is snowed over, actual troikas glide about. Dining in Russian parks is meant to complement the quiet mood. Meals are simple, unassuming, and served in a beautiful natural setting. Rather than overstuffing the realm with multiple restaurants, food is found almost exclusively at “Café Kitezh.” This is an open air lakeside venue under thatched roofs. Simple European cold cut sandwiches and fresh salads feature. We also serve Americanized foods like hamburgers and hot dogs. Meals-to-go allow guests to picnic (on Buyan-provided foods) in the lovely garden grounds. Is there anything more pleasant than sipping an ice cold drink in the park? “Garden Brews” pours beverages, alcoholic and non, to suit the season. Summertime drinks are offered ice cold. Wintertime drinks arrive steaming hot. A Baroque pavilion inspired by the Hermitage provides Palatial Gardens’ dedicated retail outlet. Merchandise rotates seasonally, meant to help guests explore the gardens. Summertime items include sunscreen, hats, and light clothing. Wintertime offerings are heavy fur coats and hats and scarves, to keep revelers warm regardless of the chill. This open air venue hosts Palatial Gardens’ ever-changing “farmers market” artisans. Tents may come and go, and needs change. Winter merchants sell beautiful, handmade holiday curios. In summer, florists cultivate a storybook flower market, plus other niceties. Ilya vs. the Robber A outdoors dueling wooden coaster overlooking Palatial Gardens. Noteworthy for its world’s-first suspended wood coaster feature, now achieved through RMC’s topper track technology! Ruslan & Ludmila The brave knight Ruslan must rescue his beloved Ludmila from the evil sorcerer Chernomor. This famous Pushkin poem is retold as a family-friendly omnimover dark ride. Bogatyr Steeplechase Race A launched, indoors steeplechase coaster! 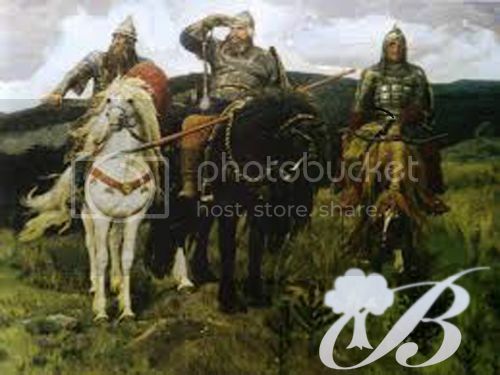 Riders sit on horse-shaped vehicles and race their fellow bogatyr. Behold, Svyatogor! A Vekoma Madhouse flat ride which is sure to astound and discombobulate! Themed to the fearful giant Svyatogor lifting a farmhouse from its foundation. The Heroes of All Time An interactive live show where children join the Three Bogatyrs and train as apprentice knights. Vladimir’s Carousel A two-story carousel modeled after the earliest historical models. Comes complete with a ring! Podacha An offshoot for “The Feast of Alexander Nevsky,” offering select foods and especially drinks – notably beer, mead, and non-alcoholic kvass. Dobrynya’s Broiler Fire-roasted shashlik meats and vegetables are served underneath a ventilated medieval tent. Ratmir Roast A food stand in a conical steeple, presenting turkey legs. 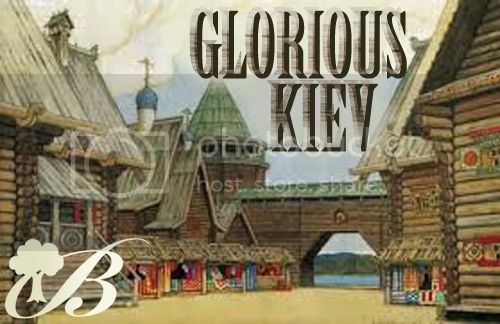 Alyosha’s Armory Guests discover costumes which aid them in the live-action roleplaying fantasy of Glorious Kiev. Novgorod Goods A beautifully ornate medieval tent presents an assortment of handicrafts made on the premises by artisans. Vseslov’s Spoils Medieval “weaponry” and clothing are sold in a blacksmith’s shop. The forest is a frequent setting for fairy tales. It is the perfect hiding place for all manner of fantastical creatures, for heroes and villains. Unknown magic waits behind every overgrown poplar, under every mossy rock. Stories of the forest are with us since childhood. Folklore Forest realizes these possibilities. Meandering paths carry families through the unconquerable woods. Thick treetop canopies mask the simple black ceiling above. There are two sides to Folklore Forest, the light and the dark. The light side, nearer to Glorious Kiev, glistens with dreamy shafts of sunlight. Bright flowers dot the lush meadows. Down enchanting trails, curlicue storybook cottages house family-friendly attractions which appeal to every age. On the dark side, the trees grow twisted and gnarled. Fearsome creatures inhabit a haunted waterway and a surreal walking hut. Brave – or foolhardy – farmers have erected a farmhouse on the wood’s boundary. Attractions on this side, nearer to the thrill rides of Enchanted Caverns, carry minor height restrictions. Buyan recognizes that Folklore Forest is likely to be a childhood favorite, and so it provides these “bridge” attractions to usher children into adulthood. The story of Vasilisa the Brave is much like Hansel & Gretel. At the behest of her wicked stepmother, Vasilisa ventures into the woods to retrieve fire. There she faces trials by the bizarre witch Baba Yaga. As a reward, Baba Yaga’s flame burns the stepmother to ashes, and Vasilisa finds liberation. Buyan Park retells this tale as a family-friendly spinning coaster by Mack Rides. Guests queue in Vasilisa’s farmhouse, where her living doll issues ride safety instructions. Train cars resemble Baba Yaga’s giant flying mortar. The journey begins as a motorized dark ride into the haunted forest. Mortars spin freely like omnimovers, the better to focus on glowing skulls mounted before the witch’s weird chicken-legged hut. Riders ascend a lift hill of bones, where a fearsome AA Baba Yaga curses their mortars with fiber optic lights. A terrain coaster ensues, following banked turns past gnarled dead oaks. 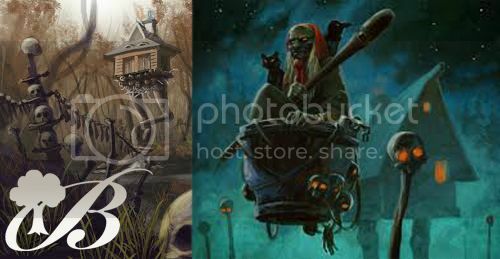 Down a break run, Baba Yaga asks “Out for a spin?” Mortars now spin independently as they travel a series of helixes and overbanked turns. A brake run leads to the climactic dark ride ending: facing backwards, mortars move through Vasilisa’s farmhouse, aflame with screen effects and red papers on fans. Baba Yaga invites guests to tour her chicken-legged hut, realized as a “box room” motion simulator ride. Guests pass through her skull-strewn yard, observing a chicken-legged dog house and giant chicken footprints in the mud. They head through the witch’s kitchen full of bubbling potions. Into the hut’s living room, guests take their seats. Through the front window screen, Baba Yaga appears happily with her mortar and pestle. Pitchfork-wielding townsfolk emerge from a thicket, intent on seizing the fearful witch. The hut flees on foot with riders within! The cabin gallops through the dried woods, across fields, down a cliff, through raging rapids, and climactically leaping across a gorge. Townsfolk pursue on horseback, flinging arrows and torches. In-cabin effects complete the scene! Real arrows pierce the walls. Smoke and water spray. A pine tree bursts through the roof! Modest Mussorgsky’s “The Hut on Fowl’s Legs” provides on-ride music. Never near a river alone at night. If you do, a vengeful Rusalka could drag you down! The rusalki are unquiet female water spirits who roam ancient waterways, and answer to the frog king Vodnik. Vodnik lures guests into an abandoned water mill and sends them forth upon magical logs. “Rusalka River” is a log flume into the rusalki’s haunted world. Logs travel a swampy mound of reeds and spirits. In a grotto, rusalki appear as Pepper’s Ghosts and yank logs down a waterfall to the lake’s depths. Logs travel a dark ride underwater kingdom. Aquatic AA creatures gather. The six-legged lake demon Bukavac pulls logs up the final lift hill. Riders escape down a 60’ plunge into the open mouth of a gigantic catfish. They emerge safely into a manmade dam lit by fireflies. Buyan uses the dark ride format to recount the tale of the Frog Princess. In this myth, the prince holds a competition to find his bride. Astoundingly, a humble frog passes the tests which human women cannot. Having won, the frog transforms into a beautiful princess, breaking Koschei’s curse. Guests ride frog-shaped vehicles, which add a gentle jumping motion to a traditional dark ride track. They travel the tsar’s palace, which is massively scaled from the frog’s perspective. Frogs perform tasks like baking, spinning and singing. For a finale, the frog vehicle transforms in a mirror, a simple one-way glass trick. Consistently, our youngest guests rate meet ‘n’ greets as their favorite attractions. For their pleasure, “Cozy Cottage Gathering” is a permanent venue where all fairy tale characters gather. Here guests powwow with Vasilisa, Baba Yaga, Ivan, Saltan, Koschei, and many more! Individual rooms reflect distinct characters, and are changed out seasonally. At midnight, the fairies dance in a mysterious circle. This Slavic superstition becomes a joyous tilt-a-whirl flat ride. Freely-spinning cars, fashioned after playful fairies, rotate around a fixed pivot; riders’ weight distribution determines spin. Adding to the craziness, the ride is enclosed within a giant mushroom so that strobe light effects further discombobulate riders. “The Russian Dance” from Tchaikovsky’s “Nutcracker Suite” accompanies this experience. Leshii is the forest guardian, a living tree-man much like an Ent. He is friend to all, and has turned his meadows into a playground. Surrounded by oversized flowers, grass and fungi, children play in a safe and charming environment. Blades of grass become slides. Vines become ladders. Flowers become playground merry-go-rounds. Mushrooms are trampolines. In the meadow’s center, a costumed Leshii interacts with visitors. Domovoi is a house spirit (think Harry Potter’s Dobby) who lives under the stove and brings good fortune. He is a supernaturally gifted chef, as guests discover in his cottage’s counter service restaurant. Domovoi loves to cook up Russian comfort food like cabbage dishes, stews and pierogis. Porridge, Domovoi’s favorite treat, is dessert. Fortunate guests might catch a glimpse of Domovoi vanishing into a cupboard, or hear him singing in the pipes. Baba Yaga’s magical oven stands in a field, heated by a skull-lantern. This small snack stand serves standard theme park fare, notably Americanized foods like hamburgers. But Baba Yaga also provides a distinctly Russian treat: Kolobok, a mischievous fairy tale sphere, served here as sweet breakfast blinis. Vasilisa the Beautiful – no relation to Vasilisa the Brave, confusingly – is famed for her uncommonly fine silk-weaving skills. 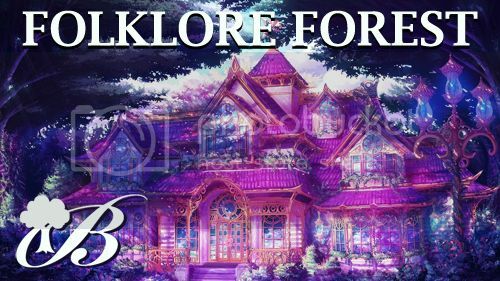 Vasilisa’s dollhouse-like abode is Folklore Forest’s main clothier. Here are delicate fabrics and immaculate dresses. Dress-up costumes allow boys and girls to play-act as their favorite fairy tale characters. Tula is Russian gingerbread. Scents of freshly-baked treats emit from a life-size gingerbread house. Goodies include Prague Cake, churchkhela, baked apples, cottage cheese pancakes and – yes – Tula bread. Each season, artisanal bakers create a model gingerbread house to display in the shop’s center. Ded Morozko – Russia’s Santa Claus – presents an assortment of gifts from the back of his wonderful sled. Vintage toys like nutcrackers and tin soldiers are sold alongside modern playthings. In peak season, live horses appear for picture opportunities. Moving on, guests are carried deep into mysterious-yet-captivating caves. Ornate caverns stretch out like a cathedral as far as the eye can see. Within these catacombs, the passages under the Siberian mountains, dwell the darker figures of Russian folklore. The tales made famous by Pavel Bazhov are featured here. Around every corner are new discoveries to be made: veins of gold, vaults of treasure, nests of monsters. 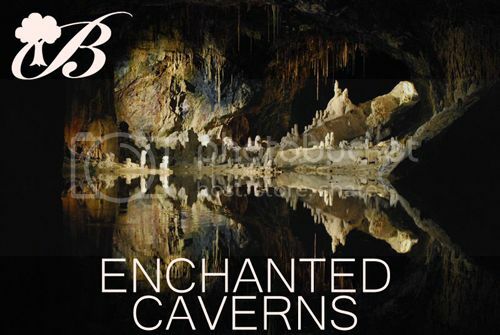 All told, Enchanted Caverns is an adventurous realm, confronting visitors with earthbound terrors. Much of Enchanted Caverns is aimed at a slightly older audience, making it an ideal gateway realm to neighbor Folklore Forest. But for its thrills, all-age entertainments guarantee that Enchanted Caverns is a safe place that every visitor will want to see. Koschei the Deathless is the greatest villain in Russian folklore, an immortal sorcerer who – some say – was later reincarnated as Rasputin. His soul lies hidden in a horcrux, basically (see “The Great Oak Hill”). Now guests are tasked with mastering sorcery themselves and tracking down Koschei’s soul, on a fun-filled 3D interactive dark ride. Guests explore the subterranean prison which once held the escaped Koschei. They learn from ancient scrolls that they are zhuhac, “dragon men,” people with latent magical powers who are destined to conquer evil. A tutorial screen before the ride introduces guests to their abilities. Using hand gestures in place of blasters – shades of Legoland’s “Ninjago” – guests shoot fireballs! Air screens detect guests’ hands movements. Riders sally forth on gliding thrones. A series of screens transports riders through forgotten crypts, over the stormy sea, all the way to Buyan Island to Koschei’s soul. Along the way, they battle Koschei’s minions – skeletal revenants, storm demons, Mongol warriors, and more – climaxing with a duel against Koschei himself. Always, guests emerge victorious! Even so, screen animations vary depending on riders’ success. Zmey is your classic dragon. It has three heads, it breathes fire, it guards treasure. It is this last part which entices guests to enter the “Lair of the Zmey.” They move through a sunken catacomb, which sets the stage by doubling as a haunted maze swarming with “scareactors” (during peak season). Performers portray folkloric vampires, alkanost, and kikimora. Premier Rides mine car trains ferry guests deeper underground towards Zmey’s pit. The ride experience initially resembles a dark ride like Knott’s “Calico Mine Train.” Through stalactite chambers, riders enter a freshly-dug tunnel littered with dragon eggs. The eggs hatch! Riders escape throngs of baby dragons. Through cisterns, they reach a great hall of golden treasure. Zmey slowly appears, first as footsteps, then a shadow on the wall, then as enormous AA heads above. The ride transforms into a simple enclosed roller coaster in the “Blazing Fury” mold! Real pyrotechnic effects beset riders, who dip down crumbling buried parapets. As a grand finale, the train stops on a brake run before the fearful Zmey revealed in whole – only for a surprise drop-track to plunge riders into an abyss, and back to the loading station. The Vila are evil storm spirits which bedevil travelers. Their gusts can drive a man insane. Buyan Park guests who crave such an experience must enter a 19th century Moscow Metro. A thundering rainstorm is heard overhead. Here in a Neo-Baroque station, riders board Premier Rides “subway” trains and roll into the tunnels. Tunnel walls shatter via projection mapping, torn asunder by the Vila’s hurricane tempests. A burst of wind propels the train through a LIM launch! Riders hurtle into a massive enclosed show building which contains a twisted “spaghetti bowl” of roller coaster track featuring 5 inversions. Set to Mussorgsky’s horrific “Night on Bald Mountain,” “Vila Tempest” subjects riders to a simulated thunderstorm. Wall projections depict rains, winds, tornadoes, and the humanoid Vila themselves! For a more relaxing experience, guests discover a beautiful theater carved like Petra into the cavern walls. The arena is darkened pre-show. Glowworms line the ceiling. Soon begins a 25-minute long live performance, “Dance of the Fire-Fairy,” inspired by Cirque du Soleil and based on Ural folklore. State-of-the-art projection mapping helps to change the scenery, lending a true fairy tale quality. The show tells of a group of Siberian prospectors around a campfire. They are visited by Poskakushka, a living spirit doll. She mesmerizes them with dance, until the dread Eagle-Owl chases her away. Only young Fedyunka believe she was a Fire-Fairy, a being who leads miners to gold. Mocked at home, Fedyunka flees into the wintry forest, where the Eagle-Owl descends upon him. Poskakushka fights off the bird. Her dance then melts away the snow. Flowers bloom. Birds sing. A birch tree opens up to reveal a glimmering gold deposit. Fedyunka lives wealthily ever after. Join the friendly Karzelek dwarves in their mines and dig for precious metals. “Karzelek Mines” is an interactive playground oasis. Guests may take up the forge. They may stoke the furnaces. They may pan for gold in an underground stream. Sort falling diamonds in a variation on Tetris. Press coins under a mighty automated hammer. Spelunk through tunnels. An app game even encourages exploration, to discover sapphires, rubies, jewels, jade, amber, silver, and copper. Siberian folktales often feature a heavenly box of purest green malachite. Such boxes provide suspended family transportation all throughout Enchanted Caverns. Guests get elevated views of other attractions, notably “Karzelek Mines.” The boxes pass through secret chambers with unique sights such as gold veins and underground waterfalls. Enchanted Caverns’ main eatery is a counter service restaurant in an elegant wine cellar. French and Italian cuisine is served alongside a selection of wines. There are vaulted brick chambers lined with oaken casks. Willow roots growing from the ceiling serve as makeshift chandeliers. Tables in a seaside cavern overlook a mural of the ocean and distant Buyan Island. Koschei’s private dining room sparkles in dark mahogany and eclectic lanterns. The Mistress of the Copper Mountain is the spirit of the Urals, patron of miners, the prospector protector. Where the mineshafts meet, the miners have erected several food stands in her honor, serving her favorite Siberian cuisine. Most popular, and least threatening, is the pelmeni stuffed dumpling stand. Another serves hot smoked omul, peasants’ fried caviar cakes. The vegetarian stand provides pickled mushrooms with salted tomatoes and cucumber. A soup stand serves borscht. For dessert, round cakes with fresh fruit. Seating is in old, disused mine carts. Here is an ice cave. There is a salt cave. Between them, a whirring contraption combines both ingredients with others, and churns out ice cream! Flavors include triple milk vanilla, salty chocolate, wild raspberry, Meyer lemon, and more. Try our special Bazhov Buns, warm blinis topped with your choice of ice cream, plus chocolate or honey sauce! Guests craving riches following “Lair of the Zmey” need look no further than “Gorynych’s Vault,” teeming with plundered dragon treasure. Realm-related merchandise is found in a white chamber of marble and gems. Jewels in the walls provide ethereal light. Unique souvenirs include rock samples and small three-headed Zmey hand puppets. Enter an alcove of jaw-dropping, tree-sized crystals, perched precariously over underground streams. This is like stepping into a house-sized geode, which displays in the center the fabled malachite Stone Flower. Toys and gifts concern child-friendly creatures such as the Karzeleks and the Fire-Fairy. The Caverns’ final glistening cache appears housed within a massive dragon skeleton. Jewelry, nametags, collectible plates and more hang on shelving affixed to the desiccated beast’s ribcage. Cashiers dwell in its massive jaw. In the ancient cave walls around the monster are fossilized trilobites and wood. Buyan Park’s final realm sits within the fortressed palace of Tsar Saltan, a bumbling figure from Russian fairy tales. This palatial complex is an artistic triumph. Elements mingle from all the cultures surrounding Saltan’s Russia. East Indian carvings coexist with Arabian mosaic tilework, Roman statuary, and Turkish tapestries. The entire cityscape is a bustling cross-cultural bazaar, where cast members portray friendly foreigners mingling throughout the day. Saltan, for all his foolishness, is a noted patron of the arts. He is especially fond of artworks based on the ancient tales. Saltan’s Tsardom bursts at the seams with artistic accomplishments from Russia’s cultural history. Russia’s real famed ballets and operas and paintings all appear, incorporated into this folkloric setting. 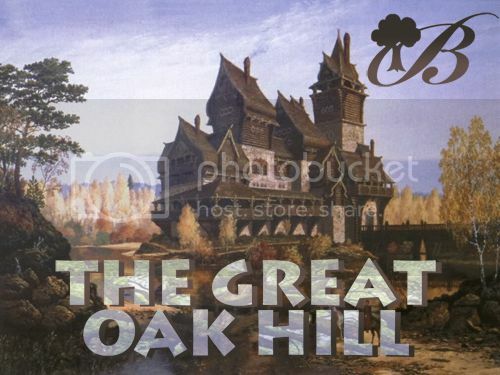 Entry from either Enchanted Caverns or The Great Oak Hill carries guests under parapet walls. 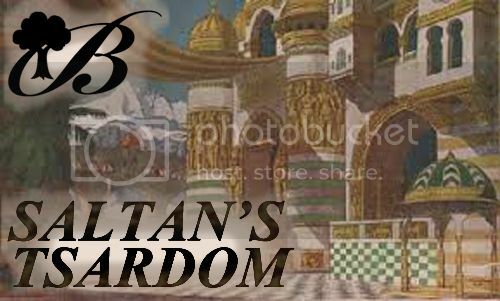 Saltan’s Tsardom is arranged as a block of boulevards around a series of theaters, galleries and marketplaces. Movement above comes from Santan’s self-designed “Russian Mountain” coaster. The land’s ceilings show a painted blue sky and distant snowcapped mountains, realized like so much else in stylized Bilibin-esque line art. With these visual touches, our Tsardom is not realistic, but a charming setting from a playful storybook. The Buyan Theatre is our park’s largest live performance venue. It is gorgeous, a fusion of Moscow’s Bolshoi Theater and Eastern influences. The Buyan Theatre is meant to compliment St. Petersburg’s rich cultural scene, as an additional outlet for the city’s many classical operas, ballets and symphonies. A magnificent lobby is accessed from both Saltan’s Tsardom and outside the park’s gates. During regular hours, park guests enjoy beloved (abridged) theatrical staples from Russia’s past. At other times, The Buyan Theatre offers hard-ticket theatrical events, ranging from the classical to the modern. Our inaugural theme park show is a 30 minute abridgement of Rimsky-Korsakov’s opera “The Golden Cockerel,” based on a fairy tale by Alexander Pushkin. The story concerns a foolish tsar rejecting love and waging war, all over a normal cockerel he believes to be prophetic. Ivan Bilibin’s old stage designs are recycled and updated. Here our aim is to not just entertain park guests, but to hopefully expose them to cultural treasures they might not already know. A separate exotic “theater” on the Tsardom’s opposite end houses the charming “Swan Lake” tow boat dark ride. This attraction is adapted from Tchaikovsky’s immortal ballet, realized as a water ride combining stylized animatronics, music and set dressing. The queue mimics an actual ballet theater. Guests head towards the orchestra pit, where the stage incongruously features boat loading on a slowly spinning turntable. Moving “backstage,” curtains give way to similar-looking fir trees. The story begins. Prince Siegfried falls in love with the transformed Swan Queen Odette, who is under an enchantment by the vile owl-sorcerer Von Rothbart. Naturally, only true love can break Odette’s curse. Magical journeys ensue on the lake, in the forest and at a costume ball. 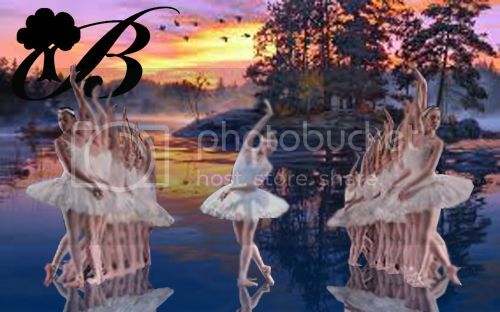 Simplistic and stylized AAs resemble fantastical combinations of swans and ballerinas. They perform whimsical dances in a respectful reinterpretation of Petipa’s original choreography. At Christmastime, “Swan Lake” is overlaid as “The Nutcracker,” based on Tchaikovsky’s other most popular ballet. Scenes now tell of a war between gingerbread soldiers and the Mouse King. Riders escape into the Land of Sweets, where they enjoy a celebratory dance of international candies. In Saltan’s most famous tale, he weds Militrisa, the youngest of three sisters. Growing jealous, her elder sisters sealed Militrisa in a barrel and tossed her into the sea. Militrisa endured typhoons and washed up on Buyan Island. Here, the Princess-Swan helped Militrisa magically return to her beloved Saltan. With “Barrel in the Sea,” guests assume the role of Militrisa. They ride spinning barrels outdoors on a turbulent river rapids ride. A statue-lined enclosed lifted hill carries barrels to an oceanic tangle of rocks overlooking the Neva. Barrels crash past cataracts and whirlpools and geysers, finally entering a Buyan Island show building and plummeting down a steep cascade back to the Tsardom. As an outdoor ride, “Barrel in the Sea” closes in the wintertime. Its queue transforms into a walkthrough art gallery. Roller coaster history arguably begins with the Russian Mountains. First manmade ice slides, then later wooden trenches for wheeled carts, these proto-coasters were especially popular in 18th century St. Petersburg. In our fairy tale world, Tsar Saltan is their inventor. His Baroque masterpiece twists and turns throughout the palace complex. “The Russian Mountain” recreates this long-lost amusement as a Mack Rides bobsled coaster. Wheeled trains traverse faux-wood half-pipe chutes. S-curves and helixes send carts snaking above the land’s shops and restaurants. Truly trackless, “The Russian Mountain” is exhilarating and exciting with just a hint of danger! No cultural mecca is complete without a world-class art gallery. But “The Spellbound Gallery” is no boring museum. Rather, this is a fully interactive exhibit! Guests receive RFID-enhanced paintbrushes. Wall-mounted “paintings” are projection effects which respond to guests’ brushstrokes. Guests can uncover old masterpieces, or create their very own works! Think of it as a physical version of Photoshop with hi-tech real world brushes and easels. Who’s ready for a dizzying competition? “Dancing Matryoschka” is more than a simple spinning teacups ride themed to nesting dolls. It is a contest between riders to see who has the fortitude to complete the most rotations! Lights shine upon the woozy winner’s doll. Such craziness is best accompanied by Arum Khachaturian’s “Russian Sabre Dance,” possibly the zaniest classical piece ever written! Riders pivot around a large central doll, which occasionally opens to reveal smaller dolls within. A traditional Russian tea room, immaculately decorated with red booths and artistic curios. Our sit-down service is more of a ceremony than a full meal. Fine teas are served with light samplings of salad, sandwich bites, miniature crepes and caviar. An additional dessert platter includes small scones, cupcakes, chocolates and jam. In the mornings, “Saltan’s Tea Room” doubles as a coffee house specializing in Turkish blends. Nestled amidst pillows and tapestries, food traders from all the thrice-ten realms gather bearing exotic spices and dishes. At Saltan’s behest, “Spice Traders” is a food court with tents all offering a distinctive international cuisine. Guaranteed to satisfy a wide swath of tastes, options include Spanish, Indian, Chinese, Greek, German, and American. Povarikha, Militrisa’s eldest sister, was renowned for her baking skills. She bides her time in the tsar’s royal kitchens, churning out stuffed pirozhki (Russian calzones), the ever-popular shashlik skewers, and a scrumptious honeycake dessert similar to baklava. Beautiful multicolored tapestries house this humble food stand. Tkachikha, Militrisa’s middle sister, was legendarily skilled with linens. Next door to Povarikha, she has set up a modest clothing shop. 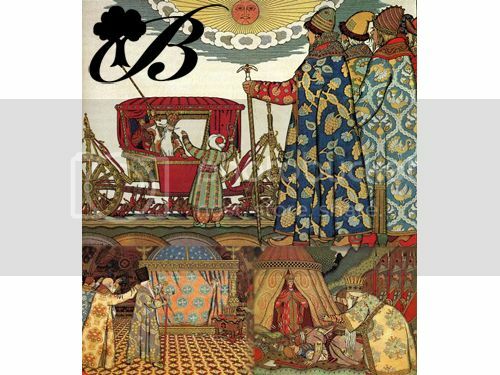 Her dresses and fabrics bear patterns based on Bilibin’s work. Tkachikha also offers traditional Russian handicrafts, plus glassware made on-site by talented glassblowers. A series of makeshift stands occupies a canopied arcade similar to Istanbul’s Grand Bazaar. As the realm’s “hub” shop, these stands present the widest variety of tsarist merchandise. Shelves buckle with goods the world over, including fine cookware and rugs. Spilling over from the nearby “Spellbound Gallery,” guests may obtain souvenir prints of their very own paintings. Frames are provided at an additional charge. A small gypsy cart rounds out the Tsardom shopping experience, with theme park knickknacks and hand painted matryoschkas. The cart’s shopkeeper is known to attract customers with regularly-scheduled belly dancing shows. As a destination resort, Buyan needs an in-park hotel to entice multiday tourists. The Grand Slavic Palace is a four-star hotel located to the left of the Great Gate of Kiev entry esplanade. This three-story masterwork is largely inspired by Ivan Ropet’s long-lost Russian Pavilion for Expo Paris 1878. 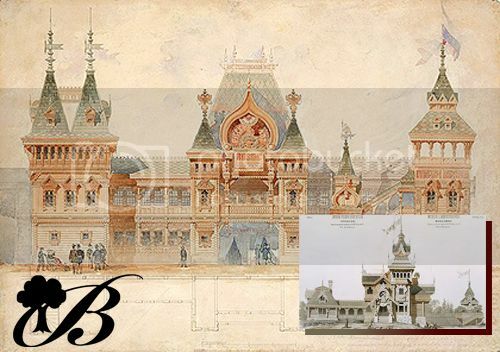 The design combines Russian Revival architecture with fantastical fairy tale elements. Throughout the building, no detail is overlooked. Wallpapers when studied reveal folklore characters, as do all furniture and fixtures. The Grand Slavic Palace offers a variety of lodging options, from two bed rooms up to stupendous penthouse suites. Most rooms overlook either the Neva River or the stunning Palatial Gardens. Hotel guests are granted unique entry gates into Buyan Park, both through a quaint brick wall into Palatial Gardens, or across a sky-bridge to the Upper Landing of The Promenade. 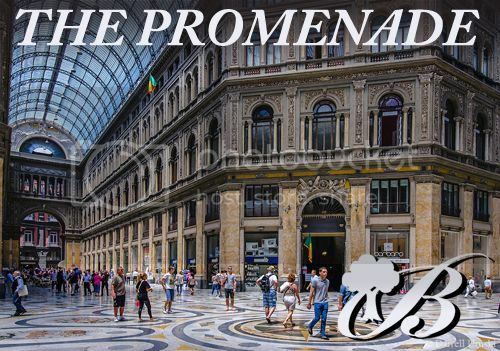 The Promenade’s dining establishments are all made available from within The Grand Slavic Palace. Our Extend the Quest special allows hotel guests to spend additional morning hours inside Buyan Park. As a luxury hotel, The Grand Slavic Hotel is priced appropriately, yet reasonably. Rooms per night range from 3,000R ($45) to 10,000R ($150), depending on the season. This is entirely comparable to similar hotels in downtown St. Petersburg. Adding to The Grand Slavic Hotel’s appeal and ambiance, guests are free to enjoy a fitness club, arcade, fine shopping, and pools both indoors and outdoors. Our spa amenities – “The Dacha Spa” - reflect the unique Russian tradition of the banya. This is a bathing ritual similar to Scandinavian saunas, complete with birch branch massages and sweat lodges. Westernized guests also enjoy a more common spa experience. As Buyan grows, additional lodging and amenities will be added, including a budget hotel to complement The Grand Slavic Palace. Buyan Park is a difficult setting for a nighttime spectacular, partly because it is mostly indoors, and partly because St. Petersburg’s peak summertime season has no nighttime! As Russia’s seasons are responsible for this dilemma, our answer is to transform all of Buyan into an enchanting show about the seasons themselves. “The Dance of the Seasons” is an indoors water parade occurring at day’s end upon the “Path of Batu” waterways throughout the park. “Batu” boat transportation ceases an hour before our performance. Show vehicles are housed backstage near The Buyan Theatre. Waterways are sunken and floats are retractable, maximizing their awesomeness. By converting an existing park element (the waterways) for our spectacular, precious indoor space is conserved, and walkways avoid congestion. Tiered steppes along the waterways provide ample viewing space. Our parade proceeds clockwise, beginning in The Great Oak Hill, and proceeding through the remaining indoor realms. Interior conditions allow us complete control over LED and projection effects. Each of the parade’s four scenes occur one-land-at-a-time, so while it is spring in Saltan’s Tsardom, it is autumn in Folklore Forest. As throughout Buyan, “The Dance of the Season” utilizes a beloved piece of Russian classical music, namely Glazunov’s “The Seasons.” The original ballet is nearly 40 minutes long; a tasteful 15 minute abridgment accompanies our parade. SCENE 1: Winter - Projection mapping covers the walls in snowfall. Projections seemingly freeze the “Batu” waterway. A converted “Batu” boat precedes the show, ridden by dancers dressed to personify the winter weather. The first of eight LED-embedded floats arrives. It represents a craggy, curlicue wintry icescape. Atop this float is Winter anthropomorphized, clad as Ded Morozko. His glowing coterie includes Hoar-Frost, Ice, Hail and Snow. A second winter float is dominated by a gigantic stylized snowflake. It spins and glistens. LED features within the snowflake refract smaller icy crystals. Snow-clad dancers populate the craft. 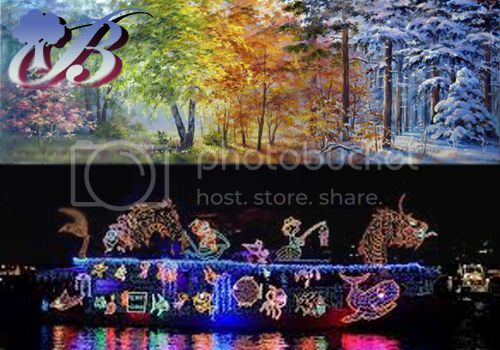 SCENE 2: Spring - Lights turn red as fiery jet skis circle the snowy floats. With projection effects, the snows melt. The springtime pageant begins. The personification of Spring rides a float which depicts a glowing, oversized flower field. Performers play as flower fairies and as enchanted birds. The jet skis buzz all around like bees. Another float depicts April storm clouds over a watery pond. Fake LED rain falls from the cloudy structure, and acts as its supports. Illuminated ripples fill the pond. Fish dancers “swim” in the float’s pond. Motorboats which resemble giant carps parade the water’s edges, dancers upon them engaging guests. SCENE 3: Summer - With the arrival of summer’s Float of the Sun, the springtime revelers flee. Father Summer rides physical sunbeams before the Sun orb, which displays a projected solar face. Fiery dancers portray sunlight. A float depicts the summertime cornfields, set amidst a towering Slavic shrine. LED pollen floats out from the poppies. Dancing cornflowers and naiads perform a ballet to the summer. Satyrs and fawns join in. Leafy boats skitter about. The final float depicts the Great Oak itself in the magnificent fullness of autumn. Its oversized foliage glows and shimmers in varying hues of gold and brown and green. Dancers before the tree frolic as fallings leaves. Master Autumn sends life-force up the Oak’s trunk, causing the entire tree to shine with a heavenly aura! APOTHEOSIS: The Sable Sky - As the parade concludes, myriad constellations sparkle in the “skies” above. Embedded LED star fields light all the many realms. This dreamlike effect remains, signaling the end of a day at Buyan Park. Guests proceed to the park exits, accompanied all the way by magical starlight and soft music. Buyan Park embodies the very best of Russian legend, myth, folklore and fantasy. These are the central elements which have informed Russian culture throughout the centuries. With Buyan Park, Russian culture grows once again, this time into the theme park arena. Our astounding halls are filled with mesmerizing subject matter, subject matter which speaks deeply and personally to every Slavic man, woman and child. With beautiful and fun design principles, Buyan Park is universally appealing, even to international guests who have yet to discover our rich subject matter. May this wonderful jewel in St. Petersburg’s crown hatch many more fantasies in the years and millennia to come! Life has a way of throwing curveballs, and the past few days have thrown several at me. I’ve been working on this park since far before this TPA season, brainstorming, sketching, and writing down ideas for ImagineNations. Starting to really hammer out the park-wide logistics over the past two weeks has been a fun, but slow, journey. For better or for worse, an incredible opportunity arose that sucked away from my proposal writing time over the past few days. At the last minute, the National Green Party Convention was looking for volunteers in my area. Although an undecided voter, I could not pass up the rare opportunity to be directly involved with the remarkable and fascinating process of American democracy. Initially, it looked like I would still be able to complete the proposal, but the Green Party asked me to volunteer several extra shifts. I couldn’t say no, especially in such a crucial and historic election year. It’s been an incredible and educational experience so far, and I have no regrets. Unfortunately, my proposal has suffered. Feasibly, I will not be able to complete my proposal by the deadline. I’m deeply disappointed in and frustrated with myself, as I’m sure some of you are too. Just writing this has been a struggle. At the earliest, with the Convention schedule and my commitments this upcoming week, I could guarantee a completed proposal by next Saturday. Asking for an extension at this stage seems unwarranted and unfair, and I don’t expect one. Please don’t feel obligated to even consider it, but I would be deeply appreciative. If not, I will still finish this theme park proposal because it really means a lot to me. Although it won’t be bound by the competition, I would appreciate any feedback that you’d have to offer, from judges, fellow competitors, and even spectators. I sincerely appreciate and value all of your opinions, and I’d love to share the entirety of ImagineNations with you all. Again, I’m incredibly sorry about this predicament. Thank you to everyone involved for this inspiring experience and for driving me to channel my creativity, week after week, into a true passion of mine. I’m beyond fortunate to be a small part of such a wonderful community. Andy, thank you very much for your notice. I have spent the morning and afternoon talking with the other judges in order to determine how best to proceed, and we have been seriously considering a couple options. As you know, deadlines are very important in this competition and we do not generally offer extensions lightly. However, we have never been faced with this type of situation and it is not something any of us expected to happen. We also understand that it is incredibly disappointing for a competitor to be forced out of the competition at the last minute, and that it may reduce the value of a win for other competitors when it suddenly becomes a whole lot easier. Unfortunately, despite much deliberation we could not come to a consensus as to how to offer an extension while remaining fair to all competitors and judges. One of the competitors has already submitted and one of the judges has commitments that will cause difficulty if the extension is prolonged, so additional complications would be present by moving the deadline at such a late date. As a result, we have decided that the original challenge deadline will be maintained. That said, we invite both Douglas Hindley and realdonaldduck to weigh in on the matter. We will seriously consider all opinions on this decision and may reconsider based on additional information. If we do revise our decision, any extension granted will be applied to all competitors, but until further notice all proposals are due by midnight tonight. I apologize for any inconvenience caused by this situation. Andy, regardless of what happens I'd like to thank you for competing in this season of Theme Park Apprentice. Your park is truly outstanding and I look forward to seeing what you have created when you are able to complete it. I also hope you will consider participating again in the future. If anyone has any questions or comments, please post them in this thread. Andy, it is a bummer that this turn of events has happened. Let it be known that I lobbied for a weeklong extension. Concluding this competition without ImagineNations, which has been such a substantial part of this season (and a great rival park), does seem hollow. I have absolutely no doubt that your passion for theme park design extends beyond a competitive framework, and so I look forward to seeing a completed ImagineNations either as a part of TPA or unofficially. Should the deadline remain tonight, I will happily offer up my thoughts on your completed park once it's posted. Still, if there is any possibility of a competition extension still going through, I would welcome it immensely! I have had a tremendous time developing and presenting Buyan Park, regardless of what now happens (going to a Russian music fireworks spectacular tonight to celebrate it). Thank you, Andy and all the other competitors, for once again providing competition, inspiration, imagination, and friendly rivalry. America the Beautiful is a new, independent theme park outside of Washington D.C. As many people who come to America wish they could see all of it, but the country is too large. Here, guests can find themed areas taking guests on a tour of each region of America. Guests can travel to New York, New England, Great Lakes, Yellowstone, West Coast, Wild West, Southeast. These “lands” surround Liberation Lake. Liberation Lake is the large lake that all of the themed areas surround. In the center of the lake guests can find the Statue of Liberty. This represents that, as different as we may be, all citizens share the same thing, liberty. Staff members are preferably hired to work in the area they lived closest to, to increase the immersive experience. For example, if someone from Maine were hired, they would work in New England. If someone were hired from New Mexico, they would work in the Wild West area. Hours are only minimally changed throughout the year. Now, let’s begin our national tour, shall we? As guests first enter the park, they are in the area of New York. As guests walk down this street, they find that the architecture and modern art they pass gives off the vibe that all are welcome and that nobody is really different, the melting pot America is. Guests find themselves surrounded by street performers, each with their own instrument, but all fitting together as if playing one song. (They will all be working off the same chords, causing a layering effect that can cause several types of music to blend.) Guests find no attractions in this area, but they can find many shopping and dining opportunities. This isn’t really an attraction, but guests will not want to miss out on it. Guests can board a train and, using the same tech as the Hogwarts Express, see many different landmarks of America as they pass through each land. The catch? This train actually moves, and can be used as transportation throughout the park. Guests also find train stops in the WIld West, and Yellowstone areas. Guests can find the Grand Canyon, Niagara Falls, Yosemite Valley, and many more American Landmarks here. Thank You Places! is a new dining experience coming to New York. Set in a theatre, guests can see the story of the cast of a show trying to “get their act together” one day before the show. The name comes from when the stage director of a show will call “Places!”, causing the entire cast to respond “Thank you Places!”. Also, places can also mean the guest’s place at the table, so the double meaning works. The story actually has some scenes that are strict “rehearsal”, in which the director is trying to get through a scene, while giving feedback that makes the audience (and the actors) crack up laughing. These scenes are also full of gags, and are a lot of fun. The other type of scene is a “cast” scene. These scenes take place backstage, as anyone who has done theatre will tell you, some of the best conversations happen. It is clear that the actors have worked together for some time, and are not afraid to make jokes about anything, making this type of scene to be just as funny as the first. At Ashley and Sam’s Sandwich Shop, guests find themselves in a family run business that has been passed down from parent to child for generations. Pictures of each owner are hung in chronological order, and the back of the menu with the history of the restaurant says it’s been in open since 1946. Guests can order several types of sandwiches, both hot and cold. This cart is placed along the streets of New York, and serves, you guessed it, hot dogs. But not only that, they also sell Italian sausages with roasted peppers and onions, meatball grinders, and nearly anything else on an elongated bun. Using a different cart in the same place as Nathan’s Sausages, guests can find Pastry Place. In the morning, guests can find Muffins, Cinnamon Rolls, Danishes, fresh Doughnuts, and hot Coffee. In the spirit of New York’s diversity, a Jewish style deli can also be found. Guests find the building as one section of a longer building. Inside, guests find that the area is very brightly colored, with blues and yellows and dark greens. Serving sandwiches throughout the day, and bagel sandwiches throughout the morning, guests can find exactly what they want at any time of day. This New York style pizzeria serving up fresh baked to order pizzas is also located in New York. Guests can find eleven different kinds of pizzas including hawaiian, greek, seafood, and many others. Guests can order by the slice, or one of the other options including salads, sandwiches and calzones. The American Collection is the largest store in America the Beautiful. Taking up nearly all of the right side of the street, guests can find nearly all America the Beautiful merchandise here. Guests can find anything from puzzles to clothes, to mugs, to stuffed Statues of Liberty and eagles, to anything and everything else you might want. Having several entrances from the street, the store is inside several connected buildings that look like separate buildings from outside, so that one giant store doesn’t seem out of place. Written for the tiebreaker proposal, The Melting Pot is designed to look like Ellis Island. Guests in the store can find merchandise from immigrants, including books, music, cookbooks, etc. Guests can also have their picture taken here, in front of scenes that make them appear to be crossing into America, as well as all around America. New York will serve as a gateway to the rest of the park, as the real New York is a gateway to America. Guests can feel the spirit of New York and America as they enter the park. First we begin moving right and continuing counterclockwise. This proposal will assume that we continue counterclockwise. Now we are in New England. Guests here find themselves in the Boston area. New city and shore architecture is mixed in with colonial buildings. This area has lots of winding side streets, and large attractions will be placed on these, to draw guests down the street. Rough Waters is a new simulator type ride in New England.Guests board a fishing boat and the storm of the century hits. Guests Can feel the ocean underneath them, for a truly immersive ride experience. Guests can also find in New England, a flying coaster themed to patrolling the area, Freedom Fliers. Guests can actually find two different endings to this ride, and can ride it again to experience the other. Guests can join Paul Revere on his famous ride on Paul Revere’s Ride. This ride has experienced the most changes from the previous round, as much of the dialogue has been shortened and guests experience more riding and scenery. The confrontation with the British troops has been eliminated, and they begin chasing riders instead. Boston Tea Party is a teacup type ride showing a comical version of the Boston Tea Party. Guests find that in each corner of the ride, a different scene is being shown. Guests can go for a spin and have a good laugh on Boston Tea Party. Independence is a street show performed on Liberation Lake. Guests can see an artistic representation of a revolutionary war battle. Using a combination of stunts and facts, this show gives guests an experience they have never had in a theme park before. This show can be seen from all around the lake, but New England, New York, and Southeast are the best places to see the show. Cape Ann’s is a restaurant serving seafood in New England. Guests can mainly find “Clambake” food here. (This is mainly clams, mussels, shrimp, scallops, lobster). Other dishes include fresh fish, served many different ways. Guests in New England can also find Constitution Tavern. For guests not wishing to eat seafood, here they can find traditional “Yankee Roast” foods. This includes many roasted meats and vegetables, along with much more. Examples include Pot Pies, Stews, Pot Roast, and Roasted Chicken. Captain Jack’s is a counter service seafood restaurant in new England. Guests here can find many fried fish dishes, including fish n’ chips, fried seafood sandwiches, and more. Food here is designed to be eaten on the go, so it serves more “street food” type dishes. Essentially, no retail changes have been made to the existing retail locations from my previous proposal. As you can see, New England is a great place to capture the New England spirit, along with experience some great food and attractions. The newest area in America the Beautiful is The Great Lakes. Guests here find themselves in a downtown area of a college town. It is clear that the area’s wide range of people creates a wide variety of architecture. This town is based on Ann Arbor, with a few elements of Chicago and Lansing. In the Windy City, guests can experience what it’s like to be caught in the top floor of a skyscraper, when disaster strikes. A tornado blows through the city, and the floor to ceiling windows (actually screens) show it all. The room guests are in moves and rocks back and forth, allowing for a great simulation of Tornadoes. Running at each hour throughout the day, guests can stop into the Motown Review for a little bit of music. Guests can hear music from the biggest stars of Motown Records, including Stevie Wonder, Diana Ross, Gladys Knight and the Pips, The Supremes, and many others, performed by live singers and musicians. In honor of Cedar Point, one of the most attended amusement parks, a rollercoaster similar to that of Cedar Point has been built. Pine Mountain Peak Coaster is taller, faster, and has more inversions than any other roller coaster in the park. Pine Mountain Peak Coaster will provide thrills and will not want to be missed. Classic Car Ride is designed to put guests behind the wheel of a real car. The guests will get to make decisions about directions and speed, in a safe environment. All of the vehicles are designed to look like early cars, including but not limited to the Ford model T, in honor of his company founded in Detroit Michigan. Guests vehicles have a gas and brake pedal, and a steering wheel. Each car is on a track so that guests cannot swerve too far, and each vehicle has bumpers on the front and back to prevent crashes. Superior Sports Center is a sports bar and grille in The Great Lakes. A sports bar is appropriate in honor of the people of this region’s love of their sports teams. Serving classic pub and grille food, this will be a great place to relax and maybe see your favorite team play a game while in the park! Rockin’ Rolls is a new sit-down restaurant in The Greatest of the Lakes. In honor of the Rock N’ Roll Hall of Fame, each room is themed to a different era of rock. Ranging from Fifties Elvis style to Eighties Def Leppard, Rockin’ Rolls has every type of rock. But it isn’t all about ambiance, the food is iconic food from the area, including creative burgers, steaks, ribs, chicken, and much more. Huron Grille is a new counter service restaurant in The Great Lakes. Guests here can find grilled favorites such as spiced chicken, burgers, and more. A large seating area is available outside. Superior Sports is a new store located directly adjacent to the restaurant of the same name. Here, guests can find merchandise from their favorite teams across the country, as well as have their name stitched onto an “America the Beautiful” team jersey. Here guests can buy merchandise from various rock bands from all eras. This includes t-shirts, hats, mugs, albums, etc. 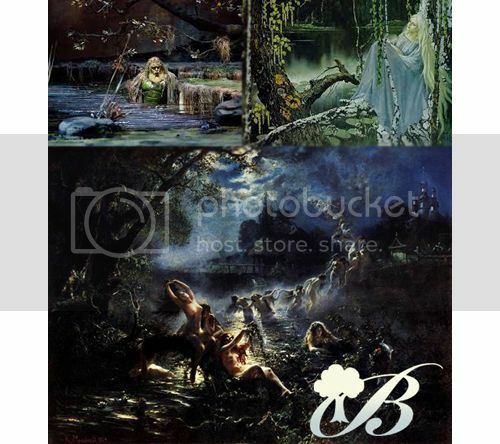 Guests may also find similar merchandise for “America the Beautiful”, recreating some of the most famous album covers in rock history. (See:”The Dark Side of the Moon, with the prism replaced by the Statue of Liberty.) Guests can also record their own singing here, over instrumental background of their favorite rock n’ roll songs. Overall, The Great Lakes is a great place to immerse yourself in the Midwest life, and go on some great attractions, and enjoy fine dining and shopping. Yellowstone Zip shows the wonders of Yellowstone from above. Guests can zipline across this themed area, and have the best view of the park anywhere, and using forced perspective, they fly over canyons and behind waterfalls. Guests can find two entrances to this attraction, one at each end. Guests get to zipline one time each way. For a thrilling zipline experience, guests will turn to Yosemite Zip. For a change of pace, guests may find themselves at Experience Yosemite, a domed theater showing a tour of Yosemite Valley, and all it’s wonders. Guests can find all of the iconic landmarks, such as Old Faithful and Lower Yellowstone Falls, along with the less known, but nonetheless spectacular sights. Board a raft, head down the Yellowstone river, and prepare to get wet on Yellowstone Rafting Challenge! Guests can find wildlife, great scenery, and Challenger Falls, a 24 foot drop into a splashdown, where anyone and everyone will get wet. Guests will accept the challenge and take the drop, on Yellowstone Rafting Challenge. Named after Yellowstone’s most iconic wildlife, Grizzly is a rollercoaster coming to America the Beautiful. Guests may experience twists and turns as they speed through the forest, reaching speeds of 69 miles per hour. Filled with thrill and adventure, Grizzly is one not to be missed. Now, the little ones get their turn. Young and Faithful Play Area Is divided into two sections. The Playground, and the Splash park. The Playground has slides, and small ropes courses. The Splash park has geysers, jumping fountains, and waterfalls. Here in Yellowstone, guests can find one of the park’s most signature dining locations, Yellowstone Trout House. Guests here can find some vegetarian, meat, and non-trout options, but, as the name suggests, the focus here is trout. Guests can find trout prepared twenty-six different ways, including (but certainly not limited to) pan fried, marinated in olive oil, grilled, barbecued, and baked with bacon and cheese. At this counter service restaurant, guests can find many different types of food. The only catch is that they have all been cooked over an open flame campfire. Guests can eat as though they are camping out in the middle of nowhere, but take it one the go. At the end of the ride, guests can find a gift shop on their way out. Selling Yellowstone Rafting Challenge merchandise, as well as America the Beautiful merchandise, guests can find what they want right after the ride. Highlights include towels, t-shirts, and sandals. Also at the end of an attraction, guests can find another gift shop at the end of Grizzly. Selling ride-related merchandise, park merchandise, and various bear-related merchandise, guest will enjoy being in this store as much as they enjoy the actual ride. Yellowstone Visitor Center is a stand-alone retail location, and is themed to a national park visitor’s center. Guests can find Yellowstone and America the Beautiful merchandise. The park merchandise is similar in style to the Yellowstone merchandise, allowing it to fit in with the theming of the land and shop. Guests can also find park ranger gear, including hats, jackets, and pins. Yellowstone is a great place to go on some great rides, eat great food, and shop for great keepsakes. It is also a wonderful place to harness the true outdoor spirit of America. West Coast is next on our journey across the nation. Upon entering from Yellowstone, guests appear to be in Yosemite National Park, where streets are lined with trees and large rockwork cliffs and mountains. Guests continuing to move forward soon find themselves in San Francisco, with all of the art, boardwalks, skyscrapers and sea lions (yes, live sea lions right off a side street!) that that implies, right woven together, a they truly are. Guests can also take a trip to Hollywood, past and present. On History of Hollywood, guests journey through the making of many types of films, from the silent reels to our modern adventures in film, guests can see it all. Guests in the West Coast can also find spectacular views of the whole park. Strap in for Redwood Drop a trip to the highest point in the park accessible to guests, then drop straight down to the ground. A randomized system will determine the drop sequence, allowing for multiple rides, each different each time. Guests seem to be climbing a redwood, that is much taller than the surrounding redwood trees. Seaside Boardwalk is a bit different from your everyday attraction. Instead of just one ride, or show, or anything, Seaside Boardwalk is a place full of classic rides that everyone loves. Guests can find Swings, a scrambler, and many other classic rides that guests could find at a California boardwalk. Guests can also find a live band playing lively “Beach Boys” style rock n’ roll music. Rides here have lower height restrictions, to allow for family enjoyment. Guests dining at Golden Gate Cuisine can find food served and invented in California. This state has unique cuisine because of its diversity. Much of this food is what you might think of as “American Food”. However, much of the culture has been influenced by other cultures, so much of this food is a fusion with Latino and Asian influences, as well as influences from other cultures. Guests eating here for lunch (between 11 and 1) also may sit in the reserved section for the nighttime spectacular. Now, I know, a restaurant called Chinatown in an American park doesn’t seem to make much sense. However, SanFrancisco has what is probably the most famous China Town in the world. Guests dining here will feel immersed in another culture’s food and atmosphere, as much of America is blended from other cultures. Guests can find traditional “Chinese American” food, as well as actual Chinese foods, along with food from other countries in the region. Chowder Houseis a counter service restaurant in West Coast. This restaurant is known for their Clam Chowder, but guests can also find other soups here as well. Placed on the lake, guests can eat in a seating area, which is reserved for the nighttime spectacular at night. Placed in Seaside Boardwalk, guests can find Shake Shack. Serving several different kind of burgers, including traditional, Mountain (Traditional with bacon and mushrooms), Beach Burger (with pineapple, jalapenos, and bar-b-que sauce), and the Nacho Volcano Burger (a burger with “lava sauce (Homemade daily)”, bacon, Fritos ™, and four different cheeses.). Guests can also find several different kinds of ice cream, and can have milkshakes made from any flavor. Guests exiting the attraction of the same name can find a gift shop. Guests can find and buy merchandise relating to the ride. This includes t-shirts that look like firefighting uniforms that say “Yosemite Valley Fire”, hats, additional t-shirts, and other firefighting and park merchandise. Located in the San Francisco area, guests here can find a wide variety of merchandise. This includes “West Coast”, “America the Beautiful”, and San Francisco merchandise. All of these categories have t-shirts, hats, mugs, music, and more. Unlike the other retail locations, this store is actually a sweetshop. Selling chocolates, saltwater taffy, caramels, hard candies and more, guests here can certainly satisfy their sweet tooth and maybe find the perfect gift to bring back home. West Coast will be a great way to embrace the feeling of the Pacific. Guests can go on great attractions, have a throwback to their childhood parks, and have some great food while they’re at it. Next on our tour, guests find themselves in an old cowboy town in the Wild West. Guests here can experience what it was truly like to be in an “old-timey” town, with all that it implies. Actors roam free in this area, all pretending to be people you might find in this time and place. Guests can have encounters with sheriff's, cowboys, village people, and even a crook or two. Sheriff! 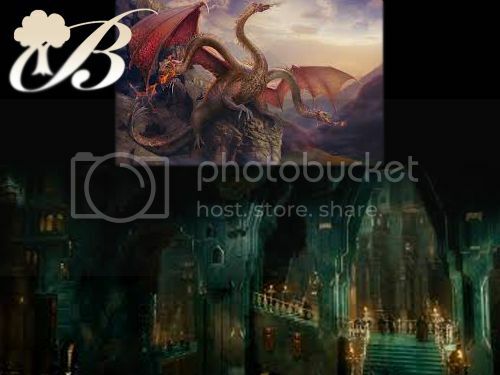 is a new dark ride coming to America the Beautiful. Join the local sheriff and catch the crook. Along the way, guests can find a lot of scenery of the west, catch the criminal, and earn the title of Sheriff for themselves! Guests can try their hand at target practice in the Shootin’ Gallery. Aim for the targets and score points for correct hits. Compete with friends to see who can get the highest score! Wagon Spin is a new trackless ride coming to America the Beautiful. Guests may board a covered wagon and spin and even crash with the other wagons. Guests on Wagon Spin are sure to enjoy this ride, and come back for a new ride each and every time. California or Bust! will tell the story of the California trail, taking guests to areas and scenery not found anywhere else in the park. Along the way, guests can find wildlife, a native american village, and great scenery. Guests are sure to love getting on these covered wagons and taking a trip out west. The Little People is a new dark ride telling the ancient story of how “The Little People, or Tsvigun” came to live with humans. In the beginning there were just the Little People. They are often described as similar to Tolkien’s Dwarves, but only knee height. They were so short that they could not defend themselves from birds that would try to eat them, so they could only come out of their nests in the summer. One winter, all the little people awoke to a large stomping sound. It was humans, coming to settle on their land. They were very peaceful with the humans and they helped each other throughout the winter. But when spring came, and the little people all wanted to hide. But the humans knew they could not survive without them, so they convinced them to make the birds go away the birds instead. So, five little people were stacked upon each other's shoulders, and dressed in one set of robes. They spoke to the birds and said that the humans had eaten all of the little people and that trying to search the old nests was pointless. So, the birds all left, and the little people and the humans all celebrated and lived happily ever after. Guests can ride through this story and watch as it unfolds around them. Forty-Niner Express is a family coaster coming to America the Beautiful. Guests in the mines can find people panning and mining for gold, until they hear that the cave is set to be blown out further with explosives. Guests shoot in and out of the mines and caves, and over hills and under rock arches. Guests at Forty-Niner Express will have a great time for everyone in the family. At Cowboy Cookout in the Wild West, guests can find a whole new experience. Waiters and waitresses are in costume and are acting as cowboys/girls, and carry conversations with guests, usually with quite a lot of improv comedy. But guests here can also order family-style off our menu of all grilled and flame-roasted foods. Guests can have a great time and great food at Cowboy Cookout. Robber’s Wings is a counter service restaurant in the Wild West area of America the Beautiful theme park. Guests coming up to the old, wooden opening in a wall can find nearly every kind of wing sauce imaginable. This includes, but is not limited to, buffalo, hot garlic, mango habanero, jerk, and honey mustard. Guests can order bone-in or boneless wings, whatever they desire. The Saloon is a bit different from the other dining locations in the park, as it is somewhere in-between sit-down and counter service. Guests here find themselves in an old-timey club or bar, only this version is much more family-friendly. Guests here can find actors in character throughout the building, and can start and carry conversation with them. Guests can hear live music, and relax and get a bite to eat while they’re stopped. The menu includes wings, burgers, many different types of unique drinks (most without alcohol, those with have a low alcohol content, including the American Amber, and Independence IPA) and much more. What else is more fitting than panning for gold here in the Wild West? Here, guests can buy bags of dirt, with maybe some gold. Guests can pan for gold themselves, along with buy gold, and smash geodes. Guests can also buy and find other rocks, some of which have the Statue of Liberty or “America the Beautiful” engraved onto them. At the end of the ride, guests can find a gift shop in the WIld West. Selling miner’s equipment, such as jackets, helmets, and flashlights, guests can have fun trying on clothes, as well as check out some cool tools they might want for home, each with “America the Beautiful” written or engraved on them. This retail location is not at the end of an attraction as you might expect. This is an independent retail location and sells Cowboy clothes, and gear. This includes, fake holsters, toy guns, hats, boots, and more. Guests can also buy “America the Beautiful” merchandise here as well. Wild West is a great place for guests to take a step back in time to the days of pioneers and cowboys. They can see the story of pioneers, and act as one themselves. And last but certainly not least, guests are in the Southeast. Upon entering from the Wild West area, guests find themselves in a town with lots of different attractions from the south. This land is not based on an actual city, unlike many of the others. The area has the feel and vibe of New Orleans, but elements from all over the region are here. Using virtual reality helmets and overhead hang arms, guests on Parasail will get the experience of flying over the Florida coast. Guests sitting four across hang from the ceiling as virtual reality film of really parasailing will line up with the movements of the arms overhead, creating a real feeling of actually parasailing. Parasail will provide views and the feeling of parasailing for guests wishing for a little change of pace from the big thrills. Launch Day takes guests on a trip into space. This simulator will provide the feeling of blasting off into space in a shuttle, and landing again back on Earth. Guests can perform real tasks, such as altitude adjustment, activating thrusters, and steering. Guests enter a small, circular room with seats facing the edges, which have screens, designed to look like windows, and smaller ones to the side. Each seat and guest has a job to do to make sure everything goes right. (If a guests does something wrong, and fails to fix it, a computer override system activates on that guest’s screen, and everything reverts to correct.) Launch Day gives guests a true simulation of space flight. At this review, guests can find not only country music from Nashville, Tennessee, but also music from the origins of Rock n’ Roll from Elvis Presley and Graceland. This show also runs at scheduled times each day, but this one is performed outside on a stage, rather than in a theater. Daytona is a new race experience coming to America the Beautiful. Guests board racecars and go out for the Daytona 500. The track is similar to “Test Track”, in that the cars are on top of the flat surface and are being propelled with mechanics underneath. However, on this ride, several cars are let out together, and the tracks may cross. When a car comes to an intersection of tracks, it has multiple options of which way to go, allowing for a new ride and race every time. Computer systems decide which way to go, so there will be no “accidents” like in real racing. Another dining experience can be found here in the Southeast area. Guests here have the option to sit down at the dinner table with other families and actors, allowing for conversation to begin. Actors are masters of improv, with responses designed on the spot, usually leading to a joke or two. The actors are all playing a part in another family, but this family in particular is lighthearted and ready to make everyone at the table laugh. The restaurant serves classic southern comfort food, including fried chicken, meatloaf, southern mac & cheese, and much more that makes guests feel right at home with the other people there. New Orleans Quarter Court is a counter service restaurant in the Southeast. Guests here can order food from inside and around the city, including gumbo, jambalaya, muffulettas, etoufee, and more. Seating is located on the street, and live jazz music can be heard here throughout the day. On the streets of the Southeast, guests can find the Southern Snacks cart. Here guests can find quick snacks and drinks from the southeast. Guests can order funnel cakes, fried green tomatoes, cheese sticks and more, along with various drinks including the ever popular Sweet Tea. At the end of the attraction Launch Day, guests can find a small retail location. Here guests can find Launch Day related merchandise, including space, shuttle, Cape Canaveral, and America the Beautiful merchandise. Guests in this store seem to be in mission control, with desks and computers lining the walls here and there. At the end of Daytona, guests can find another gift shop. Here, guests can find racing and NASCAR related merchandise, including shirts, hats, model cars, and remote controlled models of the cars on the attraction. Here, guests seem to be in a recording studio. With places to record your own singing, as well as walls lined with country music albums, guests can find nearly anything pertaining to country music. Also, America the Beautiful merchandise is sold here. Guests can find that when recording their own singing, they can choose to sing more than country songs, but country has the most options. Guests can listen to and buy their recordings, and they may find that this may be the perfect gift to someone back home. The Southeast is truly a wonderful stop on our tour, be it first or last. Guests can truly immerse themselves in the southern lifestyle, and harness the spirit of America in the south’s own special way. 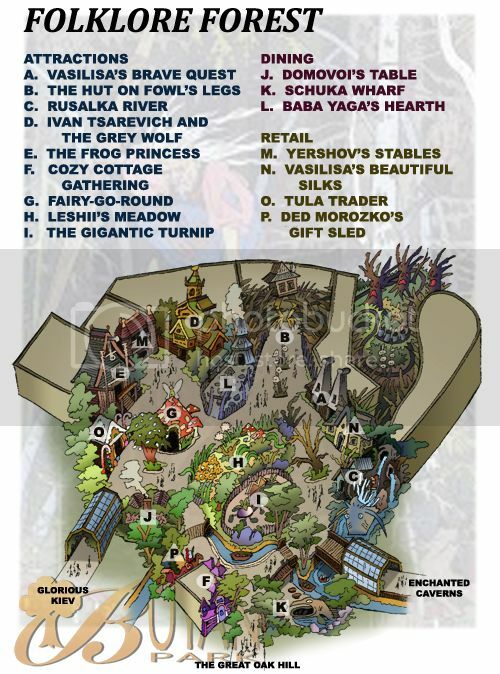 The entire park map is shown below. Every day at America the Beautiful closes with the jaw-dropping nighttime spectacular America:The Land of the Free. This beautiful show combines water screens, projection technology, fountains, fireworks, pyrotechnics, and a riveting new score composed by Gavin Greenaway, renowned for his score for Illuminations: Reflections of Earth using themes from classic patriotic tunes that every american knows. Beginning with New York and traveling counterclockwise, each area has its own section of the show. After each area of the park has had its turn, the projections on water screens begin showing much shorter clips, and the clips continue to get shorter, as all of America flashes by. Shortly, all of the projections stop, and there is a few seconds of darkness while a narrator says “But there is one thing that brings us all together…”, and all spotlights are on the Statue of Liberty. Fountains and fireworks are going off, and the show ends with an orchestra hit combined with fireworks, fire, and water fountains all going off at once. Usually, this show is at the closing of the park, however, sometimes it is shown earlier due to a late closing (during the summer the show is shown at 10. Not 11), or due to weather being uncooperative. After these shows, spotlights remain on the Statue of Liberty until park closing. And that ends our trip around America. I hope you’ve enjoyed this journey as much as I have. We’ve covered the regions of America, and been on great rides, seen shows, eaten at unique restaurants, and had some shopping opportunities along the way. I would also like to thank the judges for the chance to compete here, and bringing me back after elimination to make it this far was really a dream come true. This park is meant to capture the spirit of America in all its forms, and I believe guests will enjoy their tour of this great America the Beautiful. The deadline for Challenge 7 has now passed. Douglas and realdonadduck, thank you very much for your entries. Due to the time required to critique a full park proposal, please allow the judges a few days to complete their critiques. We hope to have a winner announced by the middle of next week. Okay, I’m drawing some inspiration from Blake here, and going for the list approach to this critique. It was impossible to fit everything I wanted to say in otherwise, so I decided to switch it up. It’s not divided into pros and cons, but instead goes in the order of your respective proposals. Your parks were so different, with one in the mythical realm and the other firmly planted in reality. So, let’s begin! ~Who is the target audience? As you say, it’s a Russian park geared to Russian audiences, and therefore isn’t typical for Americans. But, you call it a destination park for tourists. It’s best to aim it at tourists, as Russians won’t be able to afford going for more than maybe one day per year. ~Being open only three days a week will likely not generate enough money to keep the park running. ~Pricing is good, but your audience may not have the money. The median income in St. Petersburg is about 30,000R. The median rent? 20,000R. These numbers make me wonder if the average family has 7,000R to visit a park for one day. ~Two levels could work, but make sure your stairs and elevator have the capacity to move people. ~It’s smart to include an app, especially for American visitors, as this is something we’ve become accustomed to. ~I wish you listed your carts. You mention them, but I would like to know what is on them. Maybe not all of them, but some examples would be appreciated. ~Your dining in this land is good, as well as varied. My worry is that the interiors may be too different in atmosphere to mesh well together. ~The Amber Room seems like it could very easily be overdone, making it feel more like a flashy room and less like the ambiance of a restaurant. ~The Department Store is a name that sounds unappealing. It makes me think of Walmart, not the wondrous air you’re trying to bring to this area. ~As writing style goes, I wish your lands had individual conclusions. The transition feels disjointed. ~I like the Zorja canoes, but I wish I had more description of the full plot, rather than just the premise. ~An audience based improv show is always a risky move. It relies a lot on quality suggestions, and often guests are more interested in watching a story unfold. It also makes it very difficult to have any underlying plot. ~Having a dark ride scene on your transportation will likely confuse visitors unfamiliar with the story of Batu. It also makes it likely that guests will never experience it and never know what they missed. ~You describe Nav as your signature dining experience, but it seems the Feast of Alexander Nevsky more deserves this title. ~Then, you slip into flat rides. I’m glad you limited it to two, but it may be important to include at least one E-ticket ride so it doesn’t seem like an unappealing land to people looking to go go go. ~While it makes sense thematically to have one restaurant, it’s not too feasible. You’re asking for crazy lines at peak meal times. ~Palatial Pavilion’s merchandise feels uninspired. It’s more about necessities than signature items, or even leisure items. ~As I’ve already critiqued this land, and there aren’t any apparent changes, i won’t critique this again. ~The Hut on Fowl’s Legs seems fun, but it could be too scary for young children. ~Rusalka River provides a much-needed water ride for your park...no park should go without them! ~I’m glad you’ve included a playground, but I feel this specific one might fit in better in Palatial Gardens, being themed largely around flora, and a playground is more fun outside. That said, this location allows it to stay open year round. ~I literally laughed out loud at The Gigantic Turnip, which is perhaps the perfect reaction. However, the story of the peasants might be lost on riders. ~You have four individual and unique retail locations here, filled with many signature items. ~In an enclosed space like this, in an indoor park, sound may echo and it may become claustrophobic. ~The Death of Koschei the Deathless is a really interesting twist on the classic shooter, one sure to be a must see. ~Using the Moscow Metro as a setting for a ride here is a big no. It doesn’t fit in the caverns at all, and throws off the theming of the whole area. ~Dance of the Fire-Fairy is perfect for this park. In addition to being a stunning show, it will be understood in all languages, something key to the success of your shows. ~I’m a little confused by the Malachite Box. Is it a skyride? You don’t fully explain the system itself. ~Mistress of Copper Mountain is filled with Siberian food, something even other Russians find frightening. It may not get much business. ~Ice Cream! Always have ice cream. It’s a theme park staple, and it would just be wrong not to have it somewhere. ~Grotto of the Stone Flower seems like a wonder to behold in itself, and the atmosphere would be truly stunning. ~I wish the atmosphere of the land more reflected the bumbling-ness of Saltan. Instead, you’ve gone with a serious take on a comedic character, something I think was a poor choice. ~Your choice to expose guests to Russian culture in the theatre is an interesting, and good one, in my opinion. You’re exposing people to the “real” Russia as well as the Russia of folklore. ~Swan lake seems good, but the overlay seems far too expansive to be easily doable for only a few months. ~Barrel in the Sea is another fun water ride for your park, but you may not need two. While at least one is expected, guests won’t be hot at your park, due to its controlled climate. ~I’m glad to see you’ve paid homage to the beginnings of roller coasters here, and it’s fitting for this area. ~Making teacups into a competition is a really unique concept that will be loved by adrenaline seekers! ~Your three dining locations all make sense for the land, and are different from other restaurants in the park. ~Bazaar of the Tsar is great, and hopefully rather expansive. I picture it being open-air, although you haven’t described if it is or not. ~I assume your price variation also accounts for different room qualities, because for the same room, this is a huge variation in price based only on season. ~An indoor spectacular for the summer was an odd one. You worked so hard to create one that works outdoors for winter, but now have an indoor one, something that may end up feeling too small. ~“ Atop this float is Winter anthropomorphized, clad as Ded Morozko”. Nobody is going to follow this. People are just going to think it’s Ded Morozko. ~You talk about motorboats resembling the winds, but HOW do they resemble the winds? This is a truly incredible park, that, if realized, would be completely stunning to guests. However, I worry about the size of your audience, as Russians may not be able to afford it, and tourists may not understand the stories. On that note, many of your attractions require a lot of background knowledge to be accessible, and even some Russians may not understand all of it. That said, you continue to impress with this park. Your writing and astonishing images work together seamlessly to create a beautiful park. ~You’re very vague about your placement. I wish you were more specific. ~Your park may not be able to stay open in the winter. There is often snow in DC in the winter months, which may force a shutdown. ~Railroad #1 is a great form of transportation for your park, and a great way to incorporate landmarks of massive scale that could not be replicated in a theme park, but couldn’t go unseen in your park. Be careful about your writing of it though. Don’t say it’s “not really an attraction”. It is if you tell us it is! ~Thank You, Places, could be fun, but it’s not a show I want to pay a $40 (estimated) upcharge for. As an upcharge dinner show, people want to see something big. You’ve created a small, probably very funny show, but not one that people want to pay to see. ~Who are Ashley and Sam? I like the idea of giving this restaurant a backstory, but if it’s a family business, it would be better to name it after a last name. ~A Jewish-style deli is absolutely necessary for a New York land, so I’m glad you’ve included it. Breakfast spots are also essential, especially with your park opening at 8 some days. This is a well thought out restaurant. ~You’ve opted for the “Main Street Emporium” with American Collection, a good choice for this park. ~In a land based entirely on retail and dining, you need more than two retail locations to keep the land from feeling empty. ~I’ve already done this, but I just want to say I like your changes to Paul Revere. It needs to be more action based than dialogue based. ~Constitution Tavern is also a great choice, expanding on the cuisine available in this land. I still feel it needs one more dining location though. ~While none of your rides here are bad, only Pine Mountain is a true must-do. This will create really long lines and make the land feel like it’s missing something. ~Classic Car Ride needs a better title. But, it’s a perfect homage to the motor industry of this region, the birthplace of Ford. ~Rockin’ Rolls is a fun idea that could translate very well to a restaurant. However, i don’t know that there are that many eras of rock for each one to have a room. ~Superior Sports, Rockin’ Rolls, and Huron Grille seem to be your only dining locations, and they serve very similar food. You need more dining and more variety in this land. ~Basically, this land feels like it was added in at the last minute. It really seems very empty, and it just needs more to be complete. It needs to be fleshed out. ~Yellowstone Zip is a really interesting idea that hasn’t really been done in theme parks before, and that will be loved by guests. It could even be improved by expanding it to a full ropes course. this is still your main struggle: You don’t tell us enough. You need to give more details. ~This land has no counter service dining. The reason there’s so many in theme parks is because you need them to accommodate crowds. You need more restaurants in this land too. ~Yellowstone Visitor Center definitely has real potential. You have the opportunity to create park-specific merchandise that fits in beautifully in the land it’s in. ~You’ve opted for breaking this land up into two sections, which I think works somewhat here. The west coast is so expansive that no one place would truly make sense. ~San Francisco is a good choice for this area, as it’s got a true West Coast Vibe. ~History of Hollywood could be good, but I know almost nothing about it. What kind of ride system does it use? Are we going behind the scenes of movies or into movies? How will you get rights to use various movies? Is it even a ride? I really need a lot more details. ~Seaside Boardwalk could be fun, but make sure it has a distinct theme for the area, and feels immersive. Otherwise it ends up feeling like a parking lot with random rides in it. ~Both Golden Gate Cuisine and Chinatown are good restaurants, but save the reserved seating deal for Dinner! The meal will probably be more expensive, and it will persuade people to book the more expensive meal. ~A San Francisco area wouldn’t be complete without Chowder. While it’s generally associated with new England, the West Coasters love it just as much! ~You have only one true retail location here, but I love that you have a sweetshop. But, if you could have more retail, it would be great. ~This is an interesting choice. This park is more modern, and you have one land that’s very historical. But, the image of cowboys is so distinctly American that I think it fits. ~The “streetmosphere” in this land seems like it’s pretty good, and I wish you had this for other lands in your park. ~The California Trail isn’t very well known, and it’s not a part of the country generally considered the “Wild West”. It might be better to use Oklahoma. ~The Little People has a decent story, but you’ve told me nothing about how you’re going to adapt it into a ride. ~Forty Niner Express is a fun family coaster that everyone can enjoy together, something key to the success of parks. You tell a good story with it, and it fits well in this land. ~Your dining relies heavily on actors, which will make eating here a unique experience that guests will likely love. ~You have unique retail locations in this land that really add to it. ~Overall, this is definitely your most immersive land in the park. ~ I’m very surprised that you opted for New Orleans rather than a “small-town” thing, which feels distinctly more like The South. New Orleans is kind of its own thing. ~Why do you have a space ride here? You haven’t explained it and it feels out of place here. ~Daytona makes sense here, as NASCAR is a big deal in the south, and it seems like an exciting ride. ~You say this land is largely New Orleans, but it has almost no attractions from that area. You have too much Florida, generally considered the “fake south”. It would be better to focus on the Deep South. ~Having a New Orleans restaurant is a must here, as it’s one of the most distinctive types of food in the country. ~I like the idea of a music store, and it fits well here. Your nighttime spectacular seems good, but I wish I had more about it. About the music for each land, about when there’s fireworks. You leave me wanting more. Looking at your map, your park seems really small. Now, maybe that’s a good thing. On what is probably a somewhat limited budget, you can make fewer great rides rather than lots of spinners. But that’s going to drive lines to really high waits. You have more rides than any park at WDW besides Magic Kingdom. But it needs more outside the rides. You don’t talk enough about your lands for me to get a good feel of them. You don’t give enough details about your rides, and you don’t have enough dining and retail. Your ideas are good, and because of that, I’m just left wanting more. You have a good park here, but it really needs to be fleshed out more. Your concept is great though, an original concept that would certainly draw a crowd. Wow! You guys have made great parks! Congratulations to both of you, and may the best park win! -A park based on Russian folklore is a great choice for Russia's first true theme park and it is a theme that can work with the tourist audience as well. -Saint Petersburg is an excellent location choice for your park as it will attract both Russian and international audiences. Additionally, your only serious competitor is likely Wonder Island (though you may have theme park tourist competition with the Scandinavian parks, particularly those in Finland). -Given the winter weather in the region, an indoor park is a must if you intend to operate year-round. -Your park has a good selection of themed areas, though I feel it may be a little too large for a feasible indoor theme park. I would suggest either moving a bit more of the park outdoors (Glorious Kiev and Saltan's Tsardom may be good candidates due to their attractions) or perhaps shrinking the park slightly. -Your park does not look like a theme park from the outside. This will make marketing much more important in order to give potential visitors an idea of what they will find inside. -If your park is intended to be a major tourist destination, it needs to operate daily year-round (or at least 5 days per week). Limited operation on off-season weekdays is fine, but not opening at all could lead to severe disappointment and negative reviews. -Based on the size of your park, your operating hours are appropriate. -Your prices for day tickets are appropriate (and actually cheaper than a day pass at Wonder Island), but I feel that Glazunov's All-Season Pass is a little too expensive. Generally, season passes are no more than the price of three one-day tickets. I also question the need for extended ticket options as I find it unlikely tourists would spend more than two days at the park. -This is very good entrance area and a great way to welcome visitors to your park. However, be careful not to let it feel too much like a shopping mall as indoor parks can sometimes do that. -A fountain in the center is an excellent touch, but you may want to come up with something unique rather than a miniature version of an icon located elsewhere in the park. -The Great Buyan Coat Check is a necessity for winter operation, but during the summer it does seem like a lot of empty space. It would be nice to find a way to repurpose this space during the months where it isn't needed. 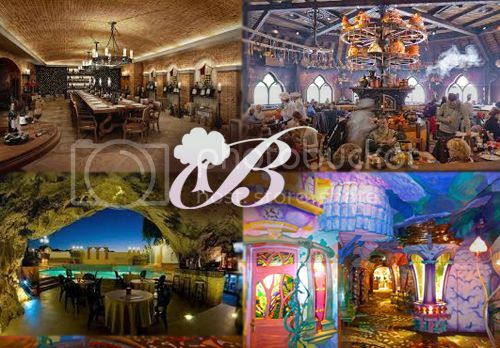 -For those wanting a special experience, Bilibin's is a must visit restaurant. This would also make anyone wanting a Great Hall restaurant at Universal extremely jealous. -Your other dining options in this section of the park are good. -Your retail options are all good fits, but I would move Upper Trading Row out of the park and into the hotel if it is not expected that day visitors will be shopping here frequently. I'd also suggest renaming Buyan Department Store to something a little more fitting to the overall theme of the park. 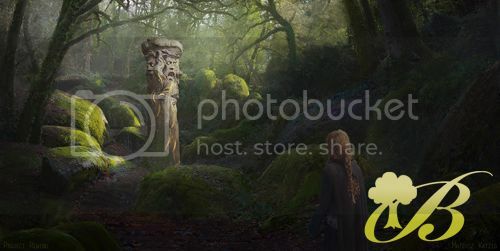 -Using the Great Oak as a centerpiece of your park is a great decision, and the building surrounding this area is the most ornate of any in your park. -Looking at your map, this section of your park seems a little too cluttered. The area inside the egg is only about 1.6 acres, so you're essentially cramming five attractions, a restaurant, and two shops in an area slightly larger than Space Mountain's footprint. -I critiqued Perun's Arrow previously, but I do like the improved ending to the attraction. -Buyan Winds is an excellent thrill ride, though by enclosing the attraction you lose some of the thrill of a drop tower. With a little more show, however, this would be top notch. -Zorja Canoes is a great family ride and a good inclusion for those too terrified of this area's thrill rides. -Tatiana's Tales is a neat idea, but it seems like something that could easily be removed to clear up this section of the park. -Flight of the Bumblebee is a fun family flat and this park's Dumbo equivalent. -Path of Batu is a nice transportation option even though the distances within your park are likely not too great. I question having so many stops on the route, however...most transportation systems stick to three or four. The finale is a nice bonus for those who either take the full loop or happen to take that segment. -Nav is an excellent eatery and will likely attract anyone who isn't interested in Bilibin's. -I'm not sure that you need two counter service food locations in an area this size, but both of them are varied. -The Firmament and Idrik's Trove are great shops and fit this section of the park well. The Sorcerer's Soul, however, feels like filler in an area that is already bursting at the seams. -Overall, this area is pretty good, I just think it is too much in too small of a space. This is also likely to be the loudest area of your park due to echo effects caused by the egg. -For those who want to escape from the noisy and crowded theme park environment, this section of the park provides a nice escape. It is also a great fit to go along with the Saint Petersburg location. -While a second exit is a good idea, it also reduces the ability to funnel everyone past the shops in the Promenade and attempt to sell them one last souvenir on the way out. -Using this area for seasonal events is a great choice as it is somewhat isolated from the rest of the park, meaning that extra crowds will not impact overall traffic flow and those with no desire to visit the event can easily avoid it. -Storyteller Trail sounds very much like the Alice's Curious Labyrinth...an outstanding walk-through attraction, but not something most guests are going to consider a signature experience or must-do part of their visit. -I would personally consider Cherepanov Trains the signature attraction of Palatial Gardens, and it is an excellent family attraction. I would like to see more focus on the gardens and less focus on fairy tale elements, however. -While basic flat rides, Firebird's Feather and Wild Troikas are fun rides that add kinetic motion to this area. The Lake Kitezh Activities and Horse-Drawn Vehicles also help to make the area feel active. -Your dining locations are well suited to the area. While it may be helpful to split Cafe Kitezh into two separate locations for crowd purposes (one for dine-in and one for to-go), it still works as is. -Your retail locations are fairly basic but are fitting for this area. -Overall, this section of the park is well crafted but it feels like it is missing an E-ticket level attraction. In the absence of seasonal events, I feel like a lot of visitors may skip this area, particularly if they only have one day. -In my opinion, this is one of the better areas of your park. I will refrain from going into detail as I previously critiqued it in full. -The decision to switch from GCI to RMC for Ilya vs. the Robber was a very smart move. 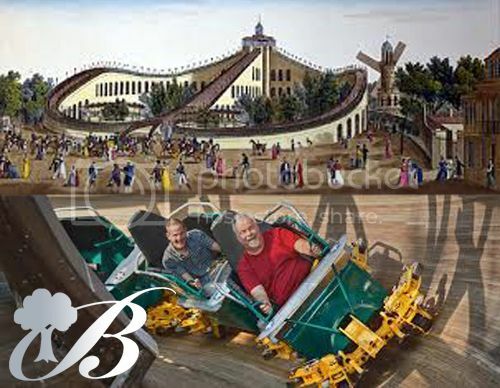 I have confidence RMC would be able to create a working suspended wood coaster while I'm not sure GCI could pull it off. -I like the decision to split this area into two sub-areas as it allows a wider variety of stories to fit together. -While not as bad as the Great Oak Hill, this section of the park does appear a little cluttered. It may be worth freeing up some space to allow for a thinker forest feel, as the center looks pretty open and somewhat diminishes the impact of two sub-areas. -Vasilisa's Brave Quest is an excellent family coaster and a Mack spinner is a perfect fit for this ride. Based on your description, I'm assuming this will be closer to Cobra's Curse than to Sierra Sidewinder, which is a good choice given the dark ride elements. -The Hut on Fowl's Legs is a decent simulator attraction, but I'm concerned about having two attractions with similar themes next to each other. I would suggest retheming either this or the spinning coaster to something that does not involve Baba Yaga in a central role. -Rusalka River is an excellent water ride, and would seriously compete with Vasilisa's Brave Quest for the title of Forklore Forest's signature attraction. Log flumes are a good choice for indoor parks as they typically splash riders but generally do not drench them. I suggest setting the height requirement for this attraction at 40" for consistency and because height requirements under 36" are generally insignificant in the industry. -7 minutes is too long for Ivan Tsarevich and the Grey Wolf. I'd suggest a happy medium of 5 minutes. -The Frog Princess is a good concept, but the execution doesn't sound that great. This one may be better if the riders are given a 3rd person perspective on the scenes as having the riders perform some tasks may be difficult to portray and the hopping could cause motion sickness. -Meet and greets are a must at any park with a large audience of children. -Fairy-Go-Round and The Gigantic Turnip are fun family flat rides and round out the offerings in this area nicely. -Playgrounds are good, and Leshii's Meadow is a decent one. To make the entire themed area work better, however, I suggest replacing this with something that makes your land feel a bit less open. -All three dining locations fit this area perfectly. Between them, you have a great variety of food available and each one has an interesting theme with its own little backstory. -I feel like you may have one too many retail locations here. However, all four do fit the theme nicely, each one has different offerings, and given that this area will likely be populated by children it is likely to be one high in souvenir purchases. -Overall, Folklore Forest is a very good section of your park and is extremely balanced. If you made it feel a little more dense like a forest, it would probably be better than Disney's Fantasyland. -This is another area of your park that I really like. It also lends itself extremely well to the indoor nature of your park. -The Death of Koschei the Deathless is not only a mouthful, it also sounds a lot more like a show than a ride. I suggest renaming this attraction to something a bit simpler. The ride itself is excellent and is perhaps the best dark ride in your park. -Lair of the Zmey is a lot more dark ride than roller coaster, but it works nicely and is great for those who want a little thrill without too much. However, there is no way you could do this with a 32" height restriction...40-44" would be much more appropriate here. 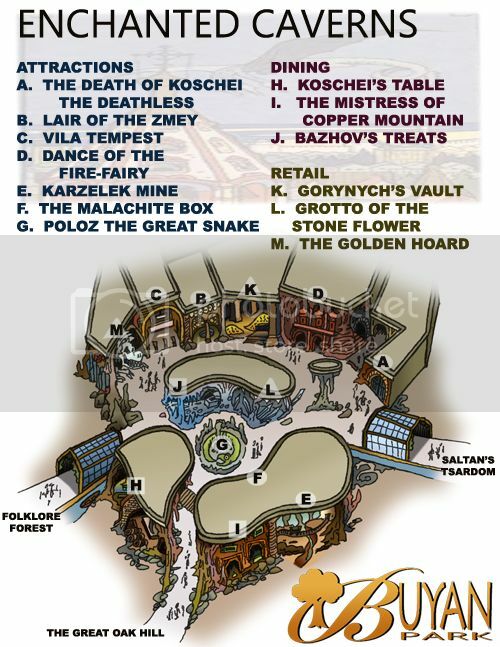 -I'm confused by how a Moscow Metro station fits within the Enchanted Caverns. Vila Tempest itself is an excellent roller coaster (and probably the most extreme at your park), but it seems to have a large thematic discontinuity with the rest of the area. -Dance of the Fire-Fairy is a fun show that will likely appeal to all audiences. The story also lends itself to a cirque show nicely. -Karzelek Mines sounds very much like an underground Tom Sawyer's Island and would likely be extremely popular with kids. -The Malachite Box is a great family attraction. -Poloz the Great Snake seems a bit unnecessary, but it is a decent flat ride. -Koschei's Kitchen is a great restaurant and is likely to be extremely popular. On the other hand, I'm not so sure that the Mistress of Copper Mountain will generate a profit as Siberian cuisine may be a little too exotic for visitors (particularly tourists). -Even though the park is indoors, ice cream is a must and Bazhov's Treats fits the bill. The ice cream contraption may also be something kids will enjoy watching. -The three retail locations in this area all fit nicely. The Golden Hoard in particular is visually impressive, and the others provide interesting and unique souvenirs. -Overall, I really like this section of your park. Other than the theme of Vila Tempest, everything fits nearly perfectly and the theme lends itself extremely well to an enclosed space. While families with small children may not spend as much time here, I could see this being a popular destination for everyone else. -Originally, this was a somewhat problematic section of your park, but you've reworked it into an excellent themed area. -Making the Buyan Theatre accessible from both inside and outside the park has pros and cons. The biggest pro is that you can generate revenue from it even when there isn't a theme park show currently running. The biggest con is that in order to justify this feature, you need to run it as a theme park show during peak season and an outside venue during the rest of the year, so you lose one of your biggest live entertainment venues for several months. -The set up to Swan Lake is a bit awkward, but the ride itself is a nice dark ride with a similar feel to It's a Small World (with more story and less annoyance). I like the seasonal overlay idea, but I do wonder how practical it is given that it sounds like the ride is 100% transformed. -Barrel in the Sea is a good rapids ride, but an overall poor fit for your park. This type of attraction is just too wet for a primarily indoor theme park. -I was really hoping you would create a throwback to the Russian Mountains, and I think you pulled this off perfectly. A+ for this family coaster. -The Spellbound Gallery sounds like an attraction that could be a huge success or an enormous flop. It is a risk, but it does sound like a cool attraction. -The decision to change to physical sets for the Last Voyage of Sadko is very smart. You went from a ride that <50% of riders would enjoy to one that >90% will likely want to do again. -A teacup spinning competition? Brilliant idea. Just make sure there are plenty of trash cans around Dancing Matryoschka for those who get a little too competitive. -Saltan's Tea Room is a fun experience, but make sure you sell it as a special experience and not a full restaurant to avoid disappointing diners. -Your other two dining locations here are great options. Povarikha's is likely to be extremely popular with locals and Spice Traders may get a ton of tourist traffic, especially for those who aren't too adventurous. -Your three retail locations all fit this area well. I feel like shopping is needed to complete the theme of this area, so you've done an excellent job there. -Overall, I really like this section of the park, and I have a hard time deciding whether it or Enchanted Caverns is my favorite section. This area has a good mix of attractions and it seems like the best area of the park for those who just want to hang out (unless participating in the interactive elements of Glorious Kiev, of course). 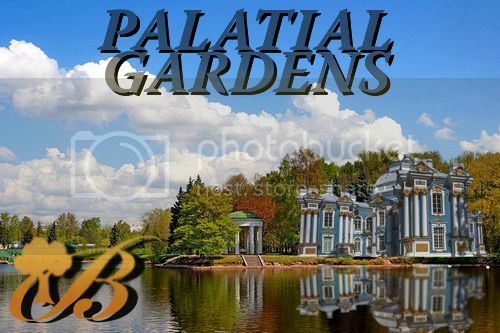 -I get where you're going with the Grand Slavic Palace, but I'm not sure that it is necessary for your park. Locals are not going to need a hotel, and tourists who will be visiting Saint Petersburg may be staying elsewhere depending on what they're doing. Your park feels like something that the average visitor could complete in 1-1.5 days, so I'm not sure how many people will actually want to stay on site. -The above said, your hotel is very good and would be a nice place to stay for those who would benefit from it. I just worry about overbuilding too quickly. Once Buyan Park becomes a true 2 day park, a hotel is an excellent addition. -I thought it would be impossible to put a parade in your park, but you have solved that problem in an ingenious manner. While I do agree that Russian summers present difficulty with nighttime entertainment, the climate controlled nature of your park allows you to create a fake night to hold this show on every operating day. -The winter scene of the Dance of Seasons is great, though I wonder if audiences will figure out that the figure is supposed to be Winter anthropomorphized. -Your spring section is a bit iffy. I'm not sure your canal is wide enough to safely accommodate jet skis along with the floats, and it feels like there may be a little too much going on here. I'd remove the jet skis and stick to the floats. -The summer floats are excellent. This may be the best scene in your parade. -The autumn scene works, but again I question whether representing the Great Oak in the parade is a good idea when it is the centerpiece of your park. Particularly when the parade is in the Great Oak Hill, I could see guests being confused by this element. Final Thoughts: Buyan Park is a park unlike any other. It is a full-fledged theme park that is mostly enclosed, allowing it to operate year-round despite harsh winter weather. It is located in Russia, a country that is not known for theme parks, yet is on par with many of Europe's regional theme parks. Your park has excellent theming throughout, several impressive attractions, and overall it is a must visit destination for an theme park enthusiast. My main concern here is that your park feels like it falls into the gap between a regional park and a destination park, which could cause problems if it fails to appeal to both locals and tourists. However, provided there is interest in the park, this would be an absolute winner and would be enough to get me to add Russia to my list of places I'd like to visit. Also, I have to ask...did you draw all those maps yourself? They are excellent throughout, and if this suddenly appeared on a website with no context I would seriously think this was an actual park in the design phase. -A theme park themed to America is a great idea if located near an international tourist destination. You've essentially taken the concept behind the original Disney's California Adventure and made it a working idea. -By locating the park near Washington, D.C., you have a huge tourist base to target for attendance. It is important that you design your park to cater to them as there is a lot of regional park competition (you'll be competing directly with Hersheypark, Kings Dominion, and Six Flags America, and to a lesser extent you'll have competition from Busch Gardens Williamsburg, Dorney Park, Kennywood, Knoebels Amusement Park, Morey's Piers, and Six Flags Great Adventure). -The layout of your park is honestly a bit uncreative and would require a lot of walking if the park is not toured sequentially. Why not create a layout more reflective of the US? -The seven themed areas you have chosen do a good job of representing the entire country, and I like your plan to hire staff that are from the regions depicted. -The hours for your park are reasonable, but the variation is strange. Why not open at 9 A.M. daily and vary the closing time based on time of year? -Your prices are reasonable and are what I would expect to pay at a destination theme park. However, your lack of a season pass option will severely limit your local audience. -New York is a great idea for an entry area as it is representative of America and is where many immigrants arrived in the country. -Railroad #1 is a great transportation system for your park, and given how important the railroad was in American history it is a must for your park. Making it feel as if guests are actually crossing the country is a nice touch. -I don't quite get Thank You Places! It seems like a fun show, but I think it would be better as a regular show and not as a dining experience. For a dining experience, the production they're rehearsing for would be a much better option than a show about rehearsing the production. -Ashley and Sam's Sandwich Shop is a great fit for your themed area, but you don't need both it and a counter service deli. -Your counter service locations are all great. While there are a lot, I can't think of any that could be easily removed. -American Collection reminds me a lot of Disneyland's Emporium. This type of store works best if the area behind each storefront is semi-independent (i.e. the merchandise and decor is different in each section but guests can move between sections and make any purchase at any register). -This area was previously critiqued, so I'll refrain from going into too much detail. -Reworking Paul Revere's Ride is a significant improvement. This version works much better than the originally presented version. -I still question the inclusion of two seafood restaurants. I also think you need at least one more counter service location here...not everyone wants a full sit-down meal. -This is a good way to represent the mid-west, but why are you creating a college town and not something that is more representative of the region? -Honestly, Windy City sounds like a letdown if the wait was more than 10-15 minutes. A tornado simulator is a good concept, but it needs more to it than video screens and shaking. -Do you mean Motown Review (as in a review of Motown music) or Motown Revue (as in a Motown music show)? At this point in the competition, things like this need to be clear. The show itself does sound like a decent production for those who want to get out of the sun for a bit. -I like roller coasters, but you tell me very little about the Pine Mountain Peak Coaster. Cedar Point has 17 roller coasters built by six different manufacturers and representing five basic designs, with each ride being a different type of ride. Which one is this similar to? -Classic Car Ride is a great family attraction and from your proposal this is the most developed attraction in this part of your park. While a rather common ride, it is still one that has value in modern parks. -You have two sit-down restaurants but only one counter service restaurant here. Generally, in any given area of a park you should have at least as many counter service restaurants as you do full service restaurants in order to avoid crowd issues. -All three dining locations are good fits for this area of the park, though a little more variety in the menus wouldn't be a bad thing. -The two retail locations in this area are good fits. I like the inclusion of a mini attraction in Backstage Passes by allowing guests to record covers of songs. -Overall, I'd say this area has some potential, but the attractions need to be developed further. With four quality attractions and one or two additional counter service restaurants this would be a pretty good themed area. -Yellowstone is a good representation of not just the national park, but all of the natural wonder in the country in general. -I'm confused how Yellowstone Zip works. If guests get to go both directions, why are there two entrances? Are there multiple lines to deal with the capacity issues of a zipline? I really like the concept of a zipline through your Yellowstone area, but it is a tricky thing to pull off in a theme park without making it an upcharge experience. -I'm even more confused why Experience Yellowstone takes guests on a tour of Yosemite Valley, and how in the world you convinced mother nature to relocate Old Faithful. Joking and typos aside, this is a quality way to show off the actual Yellowstone to those who can't actually visit, and by eliminating the ride component you make it accessible to everyone. -I'm assuming Yellowstone Rafting Challenge is a rapids ride...you don't make it clear. This sounds like a pretty good rapids ride and will certainly be popular during the summer months (though it will likely have to close during the winter). -Grizzly is a good roller coaster, but once again I'm left wondering what type of roller coaster it is. I would also suggest modifying the name slightly to avoid any conflict with Kings Dominion. -Young and Faithful Play Area will be popular with kids and is a great diversion attraction. -Both restaurants in this section of the park are good options. -The three retail locations here are all good, but you need to come up with a name for exit gift shops and not just use the same one as the ride. -Overall, I would say once again that this area has a good concept but needs more work. It is difficult to pull off a natural environment in a theme park without it feeling artificial, but you've definitely made an attempt at it. I just have a feeling a fair number of visitors wouldn't fully appreciate the area due to spending hours in line for the zipline. -I would prefer you make the west coast area devoted to San Francisco and Los Angeles rather than making half of it Yosemite themed. You already have a national park area, there is no need to give half of another section to the same theme. -Is History of Hollywood a ride, a show, or a walk-through? It would make a quality dark ride, but a show might be a better medium, and I could see a walk-through working as well. The concept is great, but I know almost nothing about it. It also doesn't fit the area too well if you're mainly theming it to Northern California. -Redwood drop is a fun thrill ride and redwood trees are definitely a California coast icon. -Seaside Boardwalk could be really good or it could feel like a generic carnival. Remember, the east coast has a lot of boardwalk parks (particularly in New Jersey), so a collection of generic spinners isn't going to go over well. I think you would be better off focusing on something unique to California here. -Golden Gate Cuisine sounds like an interesting concept and would be more what is typically referred to as "New American" food. I'd also suggest making the dining packages connected to dinner or available all day rather than restricting them to lunch. -Chinatown is a perfectly good restaurant and is a necessity in an area themed to San Francisco. -Your counter service restaurants are good options, though if you want to go totally California you need to add the east coast's first In-N-Out Burger. -The three retail locations here are all good options, though I would suggest adding a Hollywood store to go along with the ride. -Overall, this is one of the better areas of your park. Despite my dislike of a Yosemite area, it does contain a solid dark ride and the rest of the area has several good attractions. As long as you can make the boardwalk work, this is definitely a place that might be worth spending some time in. -I like the concept behind this section, but it does feel a little incongruous with the rest of your park. Why not go for a current day southwest theme instead? -Sheriff! should be a good family dark ride, though I wonder if it is too similar to Yosemite Valley Fire Patrol. Nothing wrong with having multiple interactive dark rides in a park (I'm assuming this one is interactive), but they need to be unique. -Shootin' Gallery is good old-fashioned fun, but with the rise of video games it probably won't be very popular. -Wagon Spin sounds like a controlled bumper car attraction to me. Why not use a classic bumper cars? -California or Bust! seems almost like an outdoor dark ride, which could be quite fun. Presumably guests ride through a recreation of the deserts of Arizona and New Mexico. It would be a missed opportunity if you don't have guests exit from this attraction into the West Coast part of your park. -The Little People is a good dark ride, but it seems to have minimal connection to the overall theme of your park. In a park that is largely non-fictional, adding a fantastical attraction such as this makes almost no sense. -Forty-Niner Express appears to be similar to Big Thunder Mountain Railroad and is an excellent family coaster that fits your park nicely. -The Saloon is a very interesting hybrid attraction. If pulled off properly, you'd likely have a huge line to get a table here. If done poorly, however, it would be a huge waste. -Your other dining attractions in this section of the park are satisfactory. -You have three good retail locations in this part of the park with interesting souvenirs. -Overall, this section of the park is decent on its own but doesn't seem to mesh well with the rest of your park. Not only does the theme feel a bit out of place, but the concentration of major attractions here throws off the balance of your park. I have a feeling this section of the park would probably be the busiest by far despite it being the least unique part of your park (wild west themes are very common in the industry). -New Orleans is a strange choice for a representation of the southeast. Generally, I think of Alabama, Georgia, the Carolinas, and Tennessee as being the most representative of this part of the country. -For capacity purposes, doing a Soarin' type ride for Parasail would probably be a better option. Otherwise, you need to recreate everything perfectly and make it feel real to justify the drawbacks of your version. -Launch Day sounds like a very fun simulator attraction. While it would be interesting to allow guests to crash the spacecraft, having the computer auto-correct is a lot more practical. -The Opry is a good show, but you should probably put it indoors if you want to draw a large crowd. -While it would be very difficult to pull of Daytona from a technological standpoint, if you could make it work it would be a very exciting attraction. For those who crave thrills but fear roller coasters, this would be an excellent ride. -Grandma Cassie's Kitchen is a decent concept, but I just don't think it would be very popular. It would also be incredibly expensive to run due to the number of actors involved. -For an area resembling New Orleans, the fact that the only connection is a restaurant is a little disappointing. -Southern Snacks is good for those on the move. -Nashville Records seems too similar to Backstage Passes. You'd be best having one or the other. The other retail locations here are nothing special. -Overall, this area of the park doesn't really work. Even though it fits geographically, Florida isn't really the southeast yet three-quarters of your land is themed to the state. You reference it feeling like New Orleans, yet nothing feels like New Orleans to me. I hate to say this, but unlike your other areas that just need more development, I think this one needs to go back to the drawing board and start from scratch. -The concept for your show is very good. You are essentially displaying a montage of America, which fits perfectly with the theme of your park. The ending, however, seems to say that the Statue of Liberty is what ties America together, and while it is definitely an icon I don't know that it represents all of America. Final Thoughts: You have an excellent concept for your park, and the perfect location in which to create it. I see so much potential with this design. Unfortunately, I feel like your proposal fails to fully realize the potential of your park and does not portray what it really could be. I'm sorry if this sounds a little harsh, but to me your proposal reads like an organized brainstorm, not like something that is ready to be presented to potential investors. In this competition, it is all about details, details, details, and you left a lot of holes in your work. I really like your concepts, but I feel like there is just too much missing information to get a complete picture of what your park would be like. Thank you both for your submissions! It was a pleasure to read your work throughout the competition, and it was interesting to watch your parks develop with each challenge. You both did an excellent job in this competition, and I hope you're proud of your accomplishments. Another TPA, another round of fantastic final entries! You guys have certainly made the competition interesting, and judging proposals of such quality is no easy task. First, a formal apology, throughout the course of this season, I’ve had a large amount of unforeseen circumstances pop up, both in my professional and personal life, so forgive me for getting some critiques in late (including this one). Now with that out of the way, let’s move on to the critiques. This final challenge is undoubtedly the most difficult challenge for competitors. The length alone is enough to intimidate many. Couple this with the fact that you must consider all factors which go into themed design (infrastructure, pricing, parking, retail, dining, etc.) and it’s fair to say that this challenge is the culmination of all your creative and technical abilities. For these final critiques, I’ll be eschewing my typical pro/con model and instead breakdown the critique into sections relating to each core element of the park itself. Let’s start with your location. Creating a world destination theme park for Russia is a smart choice. Being a culturally rich country with an incredibly complex and important history, Russia is probably the one country which would benefit most from having a world-destination theme park, totally unique to its national interests and culture. While tension still exists between the western world and Russia, we are now far enough removed from the days of the Soviet Union where western tourists have begun to look at Russia will interest and curiosity. A world-class theme park, specifically located in St. Petersburg—Russia’s top tourist destination—is a brilliant choice, and would do more for Russian tourism than could ever be anticipated. Your pricing seems fair and tailor-made for the local audience. It’s also very enticing to international tourists, who are used to dolling out upwards of $70-$100 USD for admission alone. Your decision to have the entire park enclosed is smart, given the often extreme weather conditions which Russia is presented with. A major concern, from a thematic perspective, is how these massive enclosed structures would look and clash with each other both from inside the park and outside the park. While I understand the need for the enclosed format, I’m concerned that it may cause some pretty serious immersive-breaking sightlines. You also run into the issue of the Palatial Gardens being out of commission almost entirely for long stretches of time due to the harsh Russian winter. This brings me to my next issue, which is the sheer cost of this park. While I understand we do not have a cost restriction for this competition, it’s tough to see how this park would be initially built with the massive costs which come with enclosing an entire park. Apart from initial construction, you also need to account for maintenance and climate control costs, which could send the price skyrocketing well past what the park would possibly bring in. Again, seeing as cost of construction isn’t a criteria set forth in the rules, I won’t be using this as a barometer for your parks overall success, but the finance part of me screams unfeasible. I would have also liked to have seen the estimated acreage and parking plan. All these concerns aside, you’ve stuck with the classic wheelspoke layout, which I still maintain is the best way to layout any theme park. It’s especially important, given the fact that almost all of your lands and attractions will be enclosed. This was a smart and great choice. The Buyan Egg is a perfect park icon, one which is both distinctly Russian and thoroughly unique. This season, the judges decided to put a particular emphasis on thematic cohesion, and to this end, you’ve succeeded tenfold. Every single element of your park is adequately and appropriately themed to fit within your overall theme. 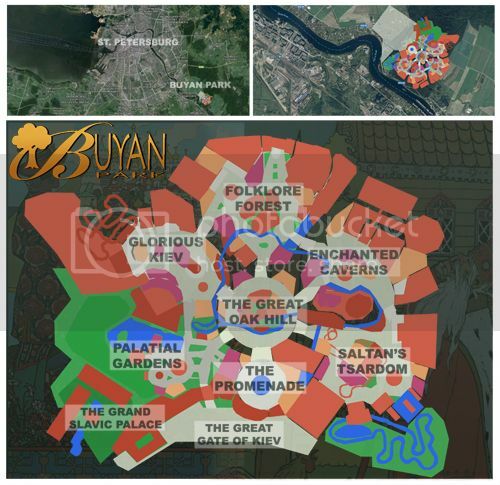 Your lands are diverse enough to offer a plethora of different architectural and narrative experiences while also keeping in perfect order with the overall theme of Buyan Park. You’ve covered a lot of bases here. 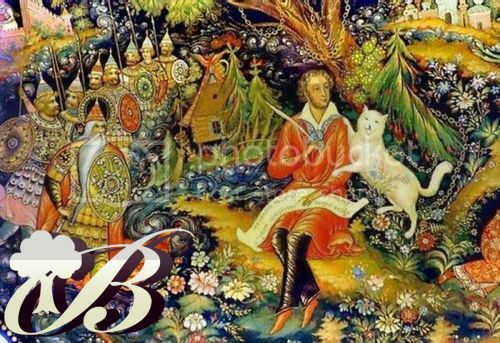 Russian folklore and myth is no small world, spanning literally thousands of years and a variety of different historical cultures. Unifying these elements together under one overall vision was not easy, and you’ve pulled it off remarkably well. I’m glad to see you took my initial critique of altering Noble Tsardom to Saltan’s Tsardom. By doing so, you’ve successfully managed to keep the core original goals and intentions of Noble Tsardom but brought it more in line with your overall theme of Russian folklore. Excellent job. As an opening land, The Promenade is a pitch-perfect example of how to do a traditional opening land. You’ve incorporated elements of classic Russian architecture with the chic feel of modern day Russia. The Grand Fountain would certainly be an awe-inspiring piece of architecture, and would give that “Wow!” factor to guests upon entry. I’m not so much a fan of having the multi-leveled approach, but due to the size restrictions and the enclosed nature of your park, it seems like a necessity given everything you want to offer guests within this area. The free coat check is certainly a necessary and welcome addition, thought the logistics of running this operation at the parks costs may, again, cause some serious financial headaches. This concern aside, I think you’ve created a near-perfect opening land for Buyan Park. The Great Oak Hill rightly stands at the heart of your park. You’ve made a very conscious and risky thematic decision by placing such a large park icon and land at the center of your park and I think you’ve succeeded. The Great Oak Tree would no doubt be your ‘must-see’ icon and would probably in contention for ‘most-photographed’ location in Russia outside of the Kremlin and St. Basil’s Cathedral. You’ve also got a great sense of ‘kinetic energy’ between Perun’s Arrow and the Zorja’s Canoes. This would certainly enhance the feel of a truly realized and lived-in land. The Palatial Gardens is certainly your most unique land for a variety of reasons. Firstly, it’s the only entirely outdoor land in your park. The natural beauty offered by the gardens would certainly be a massive draw for your older and more mature guests. It also appeals to the cultural sensibilities of the Slavic people, as you have correctly pointed out. You’re seasonal transformations of this area are well-done, and I’m glad to see that you have implemented plans to shift the land to winter attractions rather than completely shut the land down for the winter. I particularly like the Storyteller Trail as it is both thematically appropriate and does a great job of blending together natural beauty with a discovery and adventuresome factor. This reminds me of Efteling’s Fairytale Forest and is something more parks need. As far as attractions go, you’ve gone with a pretty standard line-up of common flat rides and typical “amusement park” fare, all lavishly themed. I would have like to have seen at least one major e-ticket, but given the weather issues, I could understand why you didn’t include a huge, major e-ticket. You already presented Glorious Kiev in the previous challenge, and much of my critique from that challenge still stands. The only thing I will elaborate on is that this is probably your most ‘action-packed’ land, with the amount of thrill rides and dark rides eclipsing the other lands of your park. A very well-done land indeed. Folklore Forest is arguably your most “complete” land. Not only are the attractions here all appropriately themed, but you’ve got so much variety in this land that it could almost be an entire park in itself. This would arguably be your most consistently crowded land. It offers something for everyone, and the familiarity of classic Russian folk and fairy stories are sure to please both young and old guests in equal measure. I do have one minor issue with Leshii’s Meadows and it has to do with the inclusion of trampolines. I’m not up-to-snuff on the particulars of the Russian litigation environment, so I’m strictly approaching this from and American perspective, but this screams LAWSUIT! Again, it’s a minor issue, but one that does jump out at me. Thematically, this could potentially be your most unique land, delving into the world of fairy and folk to produce some really fun and zany architectural design and natural environments. The Enchanted Caverns is arguably your weakest land in terms of aesthetics. The cavern motif is interesting and unique, but I could see it becoming pretty stale and dreary after spending extended periods of time within the land. While you have made it clear that you intend the land to incorporate Petra-esque facades, which would surely add variance to the standard cavern look and feel, I think this environment could come to feel claustrophobic and dreary. This isn’t necessarily a bad thing per-se, as you are attempting to create a certain ‘dark’ mood for the land as a whole, but it did stick out. I think this area has the most amount of “big-kid” rides in your park—both thematically and by the height requirements alone. Overall, I really like this land, but when placed alongside the others, I think it is the weakest land in your park from a purely thematic standpoint (it still succeeded, by the way, but when compared to the other lands, it lacks the gravitas and Wow! Factor of the others in my opinion). Saltan’s Tsardom is certainly your most metropolitan and ‘modern’ land and you’ve done a fantastic job of keeping in theme while offering something unique to your guests. 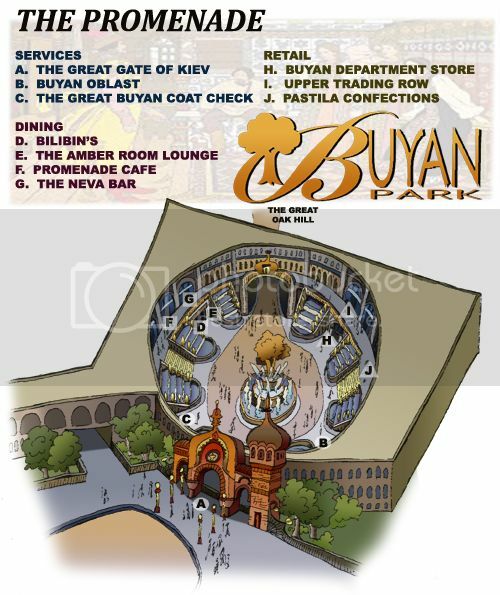 The Buyan Theatre would be a great draw for audiences looking for something more than simply rides and shops. Having it operate outside of the standard park format for special performances is also a great decision and would give Buyan Park the opportunity to offer something to guests who have no interest in the theme park itself (this is particularly smart for financial reasons). Barrel in the Sea is a little out of place, and the closure of the attraction during the winter further distracts from the lands cohesion. While the narrative is in line with the land and parks thematic concerns, I’m not a fan of closing attractions for any reason outside of extended maintenance. While you do have plans to turn it into an art gallery, without more specifics as to what art you plan to exhibit, I could see this turning out like the old Disney Gallery at Disneyland—a great little distraction walk-through but not a spectacular attraction which draws guests in. Outside of this attraction, you’ve got a solid line-up of attractions for all audiences. 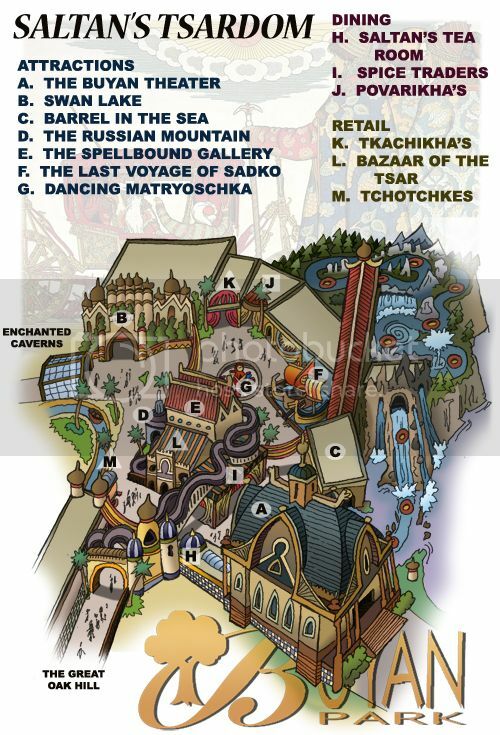 The inclusion of The Russian Mountain is both historically and thematically pertinent and I’m glad to see you’ve included it (to be honest, if you didn’t include this and the Ice Palace in Palatial Gardens, I would have had to knock you down a few points =) ). I’ve already detailed some of the particular attractions, but suffice it to say, you’ve got a great mix of attractions which would appeal to audiences of all ages and tastes. Additionally, all of the attractions contribute to the thematic or narrative aims of your park. Nothing is out of theme here. Everything you’ve designed has been designed specifically with your parks overall theme in mind. To this end, I can only say you’ve done a fantastic job of keeping this seasons key challenge front and center. Nothing is unthemed. Nothing is contradictory, and nothing exists without a thematic purpose. 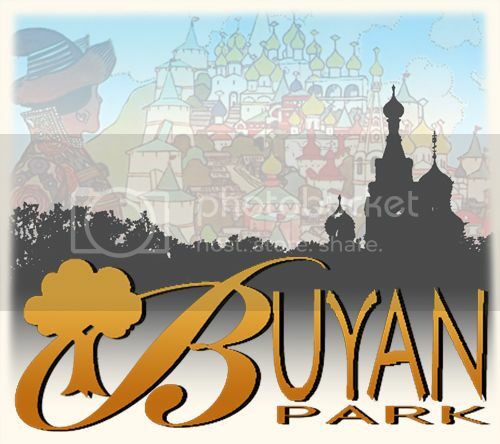 Buyan Park, if built, would stand as one of the world’s premier theme park destinations. Even with its heavy focus on regional culture and tradition, the sheer amount of unique and engaging attractions, combined with unrivalled and immersive thematic components, would certainly make it appealing to an international audience. Your decision to place the park outside of Washington D.C. is smart, given the overall theme of your park. The nation’s capital brings in millions of tourists, both national and international, every year. You also have a strong regional draw, with D.C. itself as well as Baltimore right next door. Your pricing model is pretty standard for a regional park. I would have liked to have seen another pricing model to include multi-day tickets (ticket deals beyond the initial extra day ticket). Your layout is well-designed, using the circumspect wheel design. I have some reservations about putting the entire lake in the middle, but seeing as this is common and has proven to work (see EPCOT and IOA) I can’t find too much fault with it. I would have liked to have seen a few more infrastructure details such as estimated acreage, parking, etc., without which it is difficult to get a very good visual understanding of the scope which your park will be. Thematically, you’ve got a very pertinent and broad theme to work with. The location of the park itself enhances this theme. You’re attempting to recreate these specific regions of our nation within your lands and you’ve done a decent job of capturing what makes these specific regions unique, both historically and culturally. The theme of an American park is very appealing to your target demographic—particularly international tourist. I would be slightly worried about your national tourists, as many may hail from one of you lands regional areas and thus they may find that particular land dull or dry as they live in that region every day. Nonetheless, you’ve done a good job of capturing our nation’s wide variety of natural beauty and vast cultural differences. Having your opening land be New York is clever and smart. The Ellis Island conceit of entering the nation through this icon of immigration is thematically appropriate and sets the tone for what’s to come. New England was proposed in the last challenge, and my critique still stands. Moving on to the Great Lakes, you’ve made an interesting choice to utilize a college town as your model for mid-west life. While this isn’t exactly a bad decision, it may end up with some redundant architectural design issues, as large buildings and structures are sure to take precedent throughout your park with New York, Great Lakes, and San Francisco taking on the ‘big-city’/concrete jungle feel. Now, the college town atmosphere is a little more intimate than something like New York and San Fran, but in the context of a theme park—especially one located just outside of one of the nation’s most major cities—the repeating large city buildings may lead to aesthetic stagnation. It’s tough to get a good grasp of your attractions without more detail. While we aren’t looking for full proposals to every attraction, we do like to see basic information pertaining to how the ride actually functions (what type of ride is it? What vehicles does it use, if any? What’s the general storyline?) Pine Mountain Peak Coaster seems very ground, but without more specifics, it’s hard to get a better assessment on it. The Motown Revue is a nice added show which offers a thematically appropriate non-ride attraction to the land. This was a great addition. Overall, Great Lakes is a solid land suffering from a minor themeing issues. Yellowstone is a great choice for a land showcasing our nation’s vast natural beauty. Of all your lands, this one seems to be the most unique and thematically coherent. You’ve got nature trails, a white-water raft ride, and ziplines—all taking place in a naturally beautiful environment. The inclusion of ziplines is an interesting, but welcome choice. There are some legal issues which arise with ziplines as well as guest capacity problems. Perhaps using an inverted spinning suspended dark-ride vehicle/ride system, similar to the Arthur and the Invisibles ride would be more appropriate. While I like the concept in theory, I think in practice actual zipline wouldn’t work in a theme park format. Yellowstone Rafting Challenge would stand as your parks marquee water attraction. The white-water motif in a Yellowstone themed land is very much welcome and it would have been a missed opportunity if you hadn’t included it. Grizzly sounds like a great coaster, but without more details, it’s tough to say. Regardless, having a coaster duck, dive, and weave through the natural beauty of Yellowstone would make for one of the most visually arresting themed coasters in the world. The West Coast seems to me to be a land with a bit of an identity problem. You’ve got the redwood area, San Fran area, a Hollywood themed attraction, and a boardwalk all rolled into one land. While I understand the west coast holds a variety of cultural and natural differences alone, I think you may have been better off sticking with one or two of the thematic choices (probably the San Fran motif with an extended boardwalk section). This aside, you’ve again done an admirable job of tying together a huge amount of content in one land. Your Seaside Boardwalk could probably be a separate land entirely, and I would have liked to have seen an entire breakdown of the attractions you planned to include in this area. The general description of incorporating common boardwalk rides doesn’t give me a good idea of exactly what will be in this area. This is a detriment to you, as your selling your park short of its true scope and size, in my opinion. Overall, this is a solid area which is only held back by how much it wants to show compared to how much space it actually has available. Wild West has probably got your most solid line-up of attractions. Thematically, a land themed after the wild west is almost a necessity in and American-themed park. The wild west is a thoroughly American mythos—our version of Homeric and Ancient mythology, if you will. Again, I would have liked to have seen a little more detail pertaining to your attractions, as the brief descriptions seem like they would be great attractions, but without more people, it’s tough to tell. I do like the idea of The Little People attraction. It is probably your most unique attraction in the park, but without details I can’t say for certain. You may also want to consider switching the name of the attraction, as ‘little people’ is considered offensive to certain people in today’s climate of political correctness. The Southeast would see the inclusion of some of your parks most architecturally beautiful buildings and attractions. Themeing the area after the French Colonial style of New Orleans is smart and keeps the park fresh while also keeping in line with the overall theme of your park. As for your attractions, I must admit I’m not impressed. Parasail is a great concept in theory but again would probably be very underwhelming in practice. This is essential Soarin’ with one single location as theme. Moving on to Launch Day I can’t help but notice that this is essentially Epcot’s Mission: Space. Not only is this unoriginal, but you probably would have a lawsuit slapped against you for attempting to recreate the entire ride experience. To add, this doesn’t necessarily add to the land or parks overall theme, with only a loose connection to the southeast due to the NASA programs in Houston and Florida. Lastly, while Daytona seems exciting on paper, I’m left underwhelmed by what would essentially be a glorified race-track minus the high speeds you would experience in a real race setting. The Opry is the only attraction which seems thematically sound and enhances the experience and aims of your park. I hate to sound harsh, but these are my honest thoughts. So to recap, you’ve got an aesthetically beautiful land with a mediocre attraction line-up. America the Beautiful is a grand park with lofty ambitions. It attempts to cram the enormous variety of our nation’s aesthetic and cultural differences in a theme park format and, for the most part succeeds. Ultimately, the lack of details hinders my ability to properly envision how everything is meant to ‘click’ and I’m left wanting more. This is a park which has massive potential but requires a little more detail and attention to thematic cohesion to compete with the big-guns in the industry. Another fantastic season of TPA is now coming to a close. Thank you to all the competitors who competed this season! All of your hard work and dedication has produced some of the stiffest competition and best ideas we’ve encountered throughout the entirety of TPA history! Without your imagination and innovation, this contest could never exist! Thank you all again for your time! To the final competitors, good luck! You’ve come a long way and, regardless of who wins, are all winners in our books! Apologies for the delay in announcing a winner. I've been out of the house since 7:30 this morning and just got back no more than 30 minutes ago. Congratulations, Douglas! Buyan Park is truly a wonderful creation and is one of the most unique pitches that we have seen in this competition. You have produced excellent work throughout and are worth of the title of Champion. Thank you again to both of our finalists, as well as everyone else who participated in this season of Theme Park Apprentice. Without you, this competition would not be possible. I hope that everyone enjoyed competing and I hope all of you will remain involved in future seasons. I will be posting a feedback thread within 24 hours. Please use that thread to share any comments, criticisms, and/or complaints about this season, as well as any ideas or suggestions that you have for the future. As long as the demand persists, we would like to keep this competition going, but without feedback it is difficult to determine how to improve it. Other than that, thanks again for showcasing your hard work, and thank you for another great season of Theme Park Apprentice! Wow! Thank you to everyone. To the judges, the competitors, the readers. I didn't set out this season to win with Buyan Park. I just wanted to develop and share my crazed park idea, created with a few weird self-applied criteria: Indoors, tricky location, esoteric subject matter. A personal challenge, really. It is my understanding that no one else has yet won two regular seasons of TPA. (Back-to-back at that!) It's hard to formulate a proper response. Firstly, I am retiring from regular seasons. While I have had a ton of fun that past two years, TPA needs new blood and new insights. All of my fellow competitors bring fascinating ideas and creativity to their projects, and I am excited to see these ideas grow in the future. Realdonaldduck, America the Beautiful is a wonderful idea, with perhaps more raw potential than nearly any other park concept. I loved it in your proposal, and again in the finals. Congrats on clawing your way back into the competition! With a few more details, it could be a real winner, so I eagerly anticipate what else you may eventually create. Andy, you are a spectacular competitor, perhaps now they strongest in TPA history who has yet to win the title. Who know what would've happened with you in the finals? I dearly, dearly would love to see ImagineNations' final form posted here sometime soon, for it is far too wonderful a park! Judges, as usual, great job. Your critiques do not go unheeded, and rest assured that Buyan Park still develops (at least in my own head) based on the very real issues you bring up. No park is perfect, we can always strive for more, and you all do grand work to encourage us forward while praising what we've done. Theme Park Apprentice has been a wonderful little addition to my life. I found it last year when things were really down, when I needed it most. I made lifelong friends. It returned this year with my life in much better shape. It has been invaluable in both circumstances, and a big thanks to everyone for letting me be a park of this competition! Congratulations Douglas. Without any disrespect meant to anyone, I think it was clear from the start that this contest was yours to lose. You have some great ideas, and a great way of expressing them... and your branding and messages were always spot on.